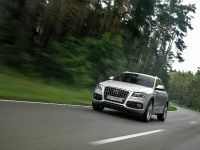 Audi is creating a new market segment: the Audi Q5, the new performance SUV, combines the dynamism of a sports sedan with an impressively versatile interior and multiple talents aimed at leisure and family use. Three powerful, efficient engines, quattro permanent all-wheel drive and an agile suspension layout form an impressive technological package for on-road and off-road use. The innovative seven-speed S tronic dual-clutch transmission and the driving dynamics system Audi drive select are among the other highlights. The Audi Q5 is the sports car in the SUV category and the perfect car for an active lifestyle – it is progressive and dynamic, spacious, multifunctional and comfortable. 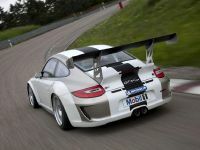 It will be appearing in the fourth quarter of 2008 at a starting price of EUR 38,300. The Audi Q5 is 4.63 meters (15.19 ft) long and 1.88 meters (6.17 ft) wide, but only 1.65 meters (5.41 ft) high, giving it the sportiest proportions in its market category. Its drag coefficient of just 0.33 also represents a top figure for its category. 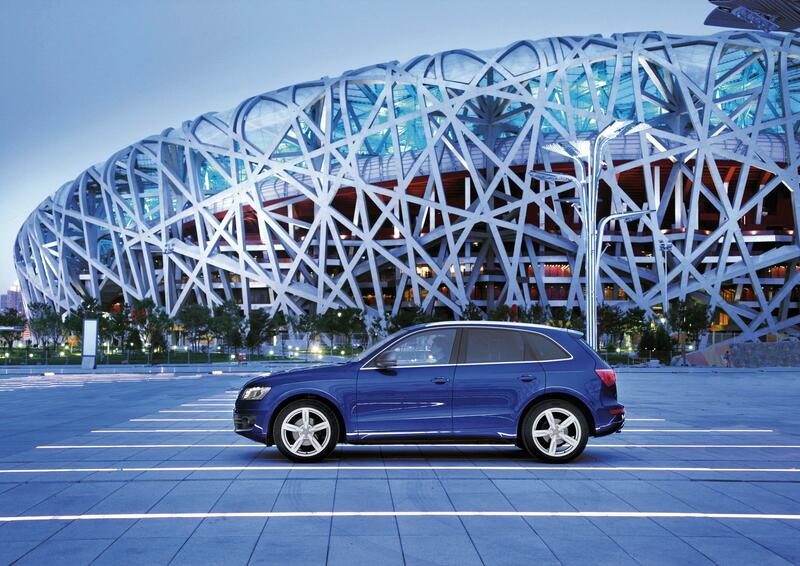 The Q5's design is elegant and sculptural – typically for Audi, which is the leading brand in this domain. The large single-frame grill dominates the front end, and the headlamps can be supplied with xenon plus bulbs and LED daytime running lights as options, in which case the rear lights also feature LED technology. The side view is dominated by large wheels and rising lines; the elegant roof contour, crowned by flat roof rails, accentuates the Audi Q5's slim, coupe-like appearance. The wraparound tailgate, like the front lid, is made from lightweight aluminum. There are three versions to choose from for the exterior add-on parts – black (standard), color-contrasting, or in the body color. Then there are two body packages. The S line exterior package creates an even sportier look, while the offroad style package has a more gritty look thanks to the underbody guard at the front and rear, and 19-inch wheels. The wheelbase of 2.81 meters (9.22 ft), the best figure in the segment, means that there is abundant space on board the Audi Q5. The seats are ergonomically shaped and of a flexible design. 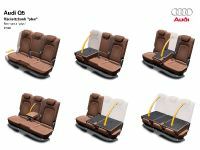 The angle of the rear seat backs can be adjusted and they can be laid flat very easily – it suffices to operate the release catches in the cargo area so that they can be folded down onto the seat cushions. This increases the cargo capacity from 540 to 1,560 liters (19.07 to 55.09 cubic ft), and there is a second storage compartment beneath its floor panel. There is a load guard as standard, and a cargo-securing kit, a dirt-resistant tray and electric drive for the tailgate are available as options. 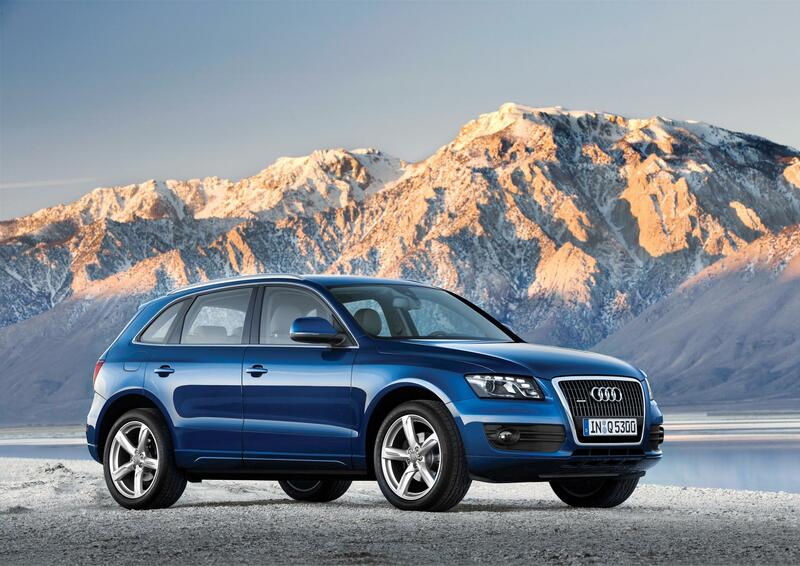 The Q5 is a performance SUV that is a highly talented all-rounder for sport, leisure and family use. As an option Audi can supply the rear bench seat plus, which can be adjusted longitudinally by 100 millimeters (3.94 in) and incorporates a load-through hatch. There is also the option of a folding seat back for the front passenger's seat. The Audi Q5 comes with an array of factory-fitted storage compartments and power sockets; a climate-controlled cup holder (option) keeps drinks cool or warm. Another ingenious detail is the fixing point in the front passenger's footwell, to which various storage facilities can be secured. The body of the Audi Q5 contains a high proportion of high-strength and ultrahigh- strength steel components. These reduce weight and at the same time improve crash safety, rigidity and vibrational behavior – the impression created by the performance SUV is of an utterly robust, comfortable and quiet car. On the front seats the belt force limiters and airbags combine in a new, particularly intelligent way. Inside, the Q5 presents a variation on Audi's clear, elegant design language. The cockpit has a bias towards the driver; its controls can be operated with intuitive ease and the build quality entertains no compromises, as is customary in an Audi. Choice materials such as aluminum, wood, chrome, leather and Alcantara lend the interior even greater appeal. The electromechanical parking brake, the intelligent key, the automatic air conditioning and the display in the instrument cluster are standard; on the Audi Q5 2.0 TDI with manual transmission, the display shows the correct gear as a recommendation for efficient driving. A large central monitor is also standard on all models. If the car is fitted with MMI navigation plus, many of the operating functions are grouped together in the MMI terminal on the center tunnel. This best-in-market operating system has entered a new generation – its operation via the large rotary/pushbutton control is now even more intuitive. 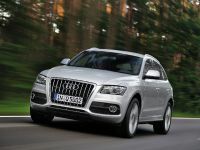 The Audi Q5 is appearing on the market with three engines – one gasoline and two TDI. All of them are direct injection units with turbocharging. Their major strengths are high performance, beefy pulling power, refined running – and impressive fuel efficiency. The 2.0 TFSI has been redesigned from the ground up. The four-cylinder engine combines three hi-tech features – turbocharging, gasoline direct injection, and the innovative Audi valvelift system for variable control of valve lift. Its high torque of 350 Nm (258.15 lb-ft) is already reached at 1,500 rpm and is maintained constantly up to 4,200 rpm; the maximum power output is 155 kW (211 hp). The Audi Q5 2.0 TDI reaches 100 km/h (62.14 mph) in 7.2 seconds from a standing start, and has a top speed of 222 km/h (137.94 mph). Its fuel consumption averages just 8.5 liters per 100 km (27.67 US mpg). 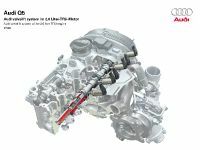 The 2.0 TDI, which owes its particular refinement to a common rail fuel injection system, also has a displacement of two liters; just like the gasoline version it has two balancing shafts. Also developing 350 Nm (258.15 lb-ft) of torque (from 1,750 to 2,500 rpm), this diesel unit is capable of powerful acceleration and develops a high power output of 125 kW (170 hp). Its average fuel consumption of only 6.7 liters per 100 km (35.11 US mpg) supplies ample proof of Audi's efficiency strategy. The two-liter TDI propels the Audi Q5 from zero to 100 km/h (62.14 mph) in 9.5 seconds, and on to a top speed of 204 km/h (126.76 mph). The 3.0 TDI is the most powerful engine in the range. The V6 diesel summons up all of 176 kW (240 hp) and – from 1,500 to 3,000 rpm – 500 Nm (368.78 lb-ft) of torque. This superlative power takes the Audi Q5 from a standstill to 100 km/h (62.14 mph) in 6.5 seconds and on to a top speed of 225 km/h (139.81 mph). On average the three-liter engine needs only 7.5 liters of fuel per 100 km (30.55 US mpg). 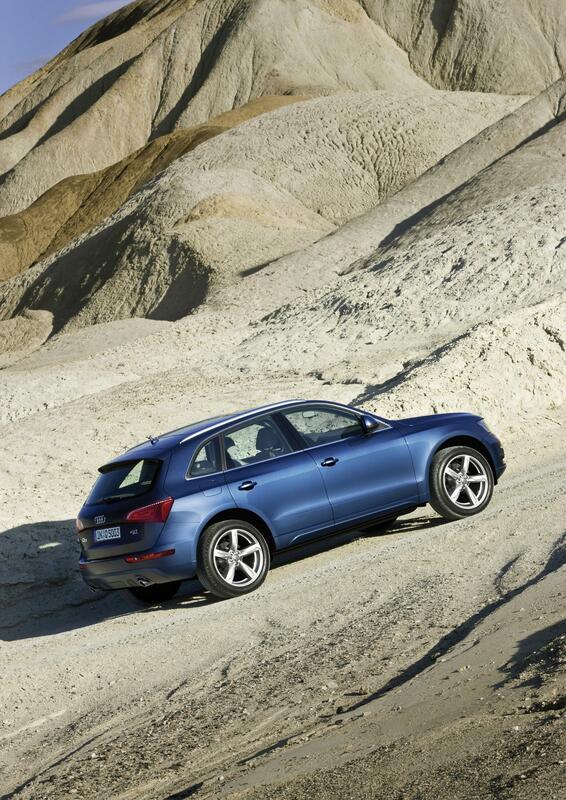 The 2.0 TDI channels its power through a six-speed transmission. For the 3.0 TDI and 2.0 TFSI, Audi has developed a new generation of the dynamic S tronic – the innovative dual-clutch transmission now has seven gears. The hi-tech unit changes gear within a few hundredths of a second, and also provides astonishingly smooth gearshifts and high efficiency. The driver can set the seven-speed S tronic to change gear automatically or they can decide for themselves when to shift gear, optionally also via shift paddles on the steering wheel. As on the Audi A4, the best midsize sedan in the opinion of the trade press, the driveline of the Audi Q5 features a differential located ahead of the clutch, and immediately behind the engine. This repositions the front axle well forward, resulting in a long wheelbase and an ideal axle load distribution. That in turn is the key to the Audi Q5's major strengths – its unruffled directional stability, high standard of comfort and thrilling dynamism. Audi equips all versions of the Q5 with quattro permanent all-wheel drive. This distributes the engine's power 40:60 between the front and rear wheels, producing a slightly rear-biased, sporty characteristic. If need be, the quattro powertrain can divert up to 65 percent of the torque to the front wheels, or as much as 85 percent to the rear. The suspension, too, underscores the dynamic character of the Audi Q5. The direct steering layout provides an intimate link between the driver and the road. The five-link front suspension and the trapezoidal-link rear suspension are made substantially from aluminum, and the underslung steering gear applies adjustments at the steering wheel directly to the wheels. Large brakes provide powerful deceleration. 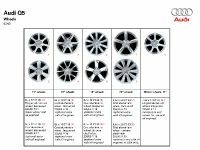 17-inch alloy wheels with size 235/65 tires are fitted as standard, or Audi can supply wheels measuring up to 20 inches in diameter as options. Audi's performance SUV drives with sporty precision and unwavering stability, while always providing a comfortable ride. Its ESP stabilization system incorporates new functions that the competition is unable to match. For instance, the ESP has a sensor that identifies when a roof rack is fitted and then knows that the Audi Q5's center of gravity is higher – this is significant, because the roof load may be as much as 100 kilograms (220.46 lb). In this instance the ESP cuts in slightly earlier once the handling limits are approached; this allows the system to adopt a very dynamic basic characteristic. With a trailer load of 2.4 metric tons (4409.25 lb) (braked, at a gradient of eight percent) the Q5 is a powerful towing vehicle. 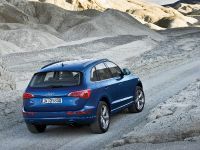 But the Audi Q5 also excels on rough terrain. Its climbing performance is an exceptionally high 31 degrees. The angles of approach and departure are 25 degrees, and the ramp breakover angle where the wheelbase really does matter is 17.6 degrees. The ground clearance is a substantial 20 centimeters (7.87 in) and a wading depth of 50 centimeters (19.69 in) is permitted when driving through water. The standard-fit hill descent assist makes driving down steep slopes safer by holding the speed at below 30 km/h (18.64 mph). The ESP and ABS use special characteristic maps for off-road driving. The ESP majors on maximum traction in off-road conditions. The ABS automatically identifies the surface conditions and selects the ideal control strategy for sand, gravel or scree. On the road, too, a whole package of optional high-end technologies make the experience of driving the Audi Q5 even more captivating. The Audi drive select control system manages the engine's throttle response, the power assistance for the steering and the S tronic shift points in automatic mode. The driver determines at the push of a button whether these functions should have a predominantly comfortable, balanced or sporty response. If the MMI navigation plus system is also fitted, there is a fourth characteristic map that the driver can program as preferred. Audi drive select can also be extended with two other innovative technologies – electronic control for the shock absorbers, and Audi dynamic steering. Equipped with a superposition gear, it varies the steering ratio and power assistance continuously depending on road speed – between a direct ratio at low speed and an indirect ratio at high speed. Near the handling limits, the dynamic steering stabilizes the Audi Q5 in tandem with the ESP by applying minor adjustments to the steering with lightning speed. Audi is equipping its new performance SUV lavishly – such items as the automatic air conditioning and the audio system with eight speakers are included as standard. There is a particularly attractive system of multimedia components available. In the top specification, MMI navigation plus with hard drive and DVD drive, a Bluetooth phone, a TV tuner, an intelligent speech control system, digital radio reception, an interface for an iPod or MP3 player with USB connection and a high-end sound system from the Danish specialist Bang & Olufsen can all be combined. The top navigation system uses a high-resolution monitor to provide a new, three-dimensional map display. Its hard drive can also store music files in MP3 format. Audi can on request equip the Q5 with hi-tech systems adopted from the full-size category, making driving an even more controlled, relaxing affair. The Audi parking system advanced is a parking aid with rearview camera, Audi lane assist helps the driver to stay in lane, and Audi side assist alerts the driver to potential hazards when changing lane. The adaptive cruise control system keeps the performance SUV at a constant distance from the vehicle in front, and the auxiliary function known as braking guard warns an inattentive driver to prevent a nose-to-tail collision. 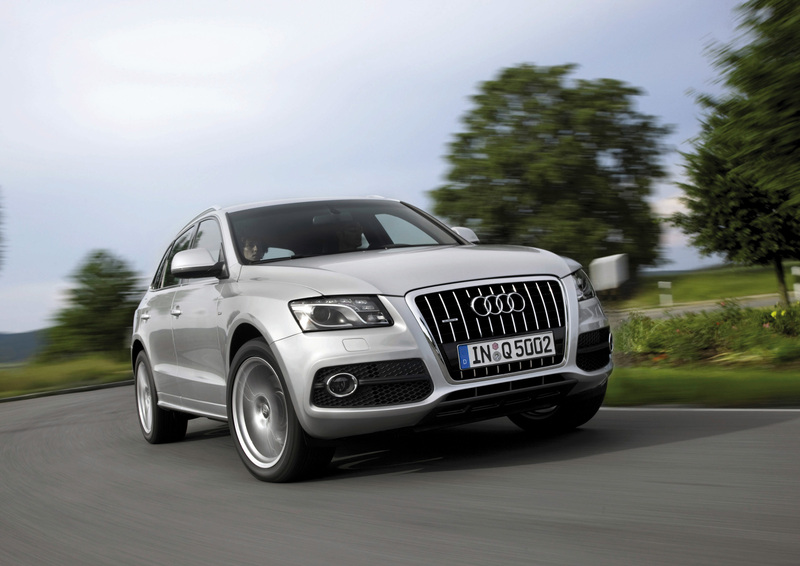 The other equipment items likewise underscore the Audi Q5's status as a performance model. These include the convenient key for keyless access, standard-fit tire pressure monitoring, a large panoramic sunroof, three-zone automatic air conditioning, roller sun blinds for the rear side windows and the dynamic cornering light system Audi adaptive light. The high-beam assistant switches automatically between high-beam and low-beam headlamps. The front seats can be adjusted, heated and cooled electrically. The Audi Q5 is a new kind of SUV: it combines the dynamism of a sports sedan with an impressively versatile interior and a wide range of practical features for leisure and family use. Powerful, efficient engines, quattro permanent all-wheel drive and an agile suspension layout form an impressive technological package for on-road and off-road use. Highlights such as the innovative S tronic sevenspeed dual-clutch transmission and the driving dynamics system Audi drive select are the evidence that substantiates the Q5's claim to Vorsprung durch Technik. The sportiest SUV in its class, it is dynamic, multifunctional and comfortable. Every new Audi makes its dynamic nature visually apparent at first glance. The Audi Q5, too, has the sportiest proportions in its vehicle segment: it is 4.63 meters (15.19 ft) long and 1.88 meters (6.17 ft) wide, but only 1.65 meters (5.41 ft) high. Its body design comes across as powerful, athletic and emotionally charged. The new Q5 restates the Audi brand's claim to lead the way in automotive design. The paneled body of the Audi Q5 exhibits stylistic consistency throughout, as if carved out of a single block. The volumes of the forward structure and passenger compartment flow harmoniously into one another; sharp contours delimit sculptural, softly modeled surfaces on which the light creates ever-shifting, intriguing patterns – this optical precision is the embodiment of Audi's uncompromising standards of quality. The Q5's forward structure is meticulously shaped – as on every Audi, it is dominated by the large single-frame radiator grill. The design of its struts provides vertical accentuation, and its V-shaped contour continues on the front lid. On the four-cylinder versions the grill is in Stone Gray, and on the 3.0 TDI it is painted in gleaming Black. The air inlets are subdivided by horizontal struts that support the standard halogen front fog lamps. With their slightly angular cut, the headlamps lend the Audi Q5's face an air of resolve. Audi presents their technology in an elaborate, almost artistic way. The covers over the turn indicators and adjoining the single-frame grille, shielding the failsafe bulbs, subtly incorporate Q5 logos – this typifies the great attention that the brand pays to even the tiniest of details. 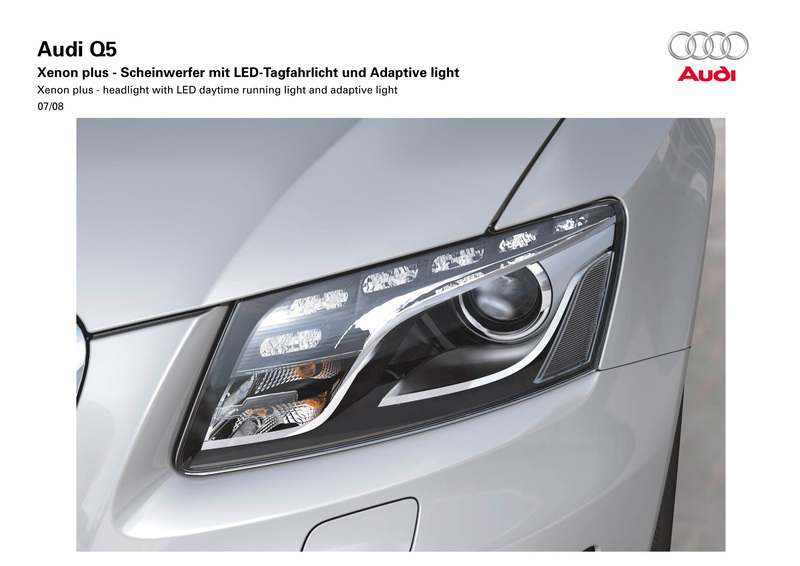 The Audi Q5 comes with H7 headlamps as standard. 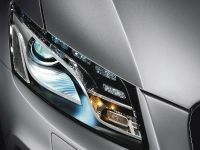 The daytime running lights – with long-life bulbs as their light source – are already standard here; the highbeam and low-beam headlamps are housed in separate chambers. 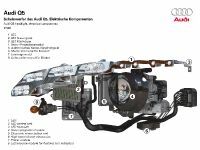 On the xenon plus version, a mercury-free gas discharge bulb is the light source for the lowbeam and high-beam headlamps. Above and around them is a "wing" – a chrome vapor-coated contour reminiscent of an eyebrow. Twelve daylight-white lightemitting diodes arranged above each "wing" constitute the daytime running lights, with an energy consumption of just a few watts. 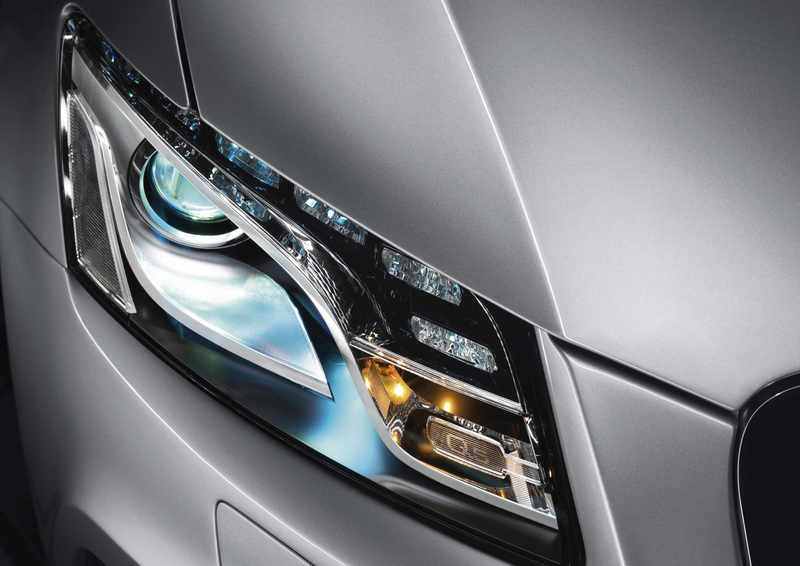 The xenon plus headlamps can also be combined with the adaptive light cornering light system. The subtle interplay between its lines is what makes the side view of the Audi Q5 so intriguing. Above the sill area, which serves as the technical and visual basis, a clearly ascending dynamic line runs all the way back to the tail end, where it forms the bumper edge – thus accentuating the forward momentum of the body. The tornado line below the windows starts at the headlights, eases off somewhat in its intensity as it crosses the doors and finally merges with the upper edge of the rear lights. It, too, describes a slight ascent. The window edge runs initially parallel to the tornado line, until it swoops upward at the level of the third side window. The feature line intersects the roof edge at a slight angle, thus enhancing the impression of lowness. 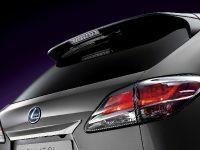 Finally, the lid line is the join between the side section and the bumper – it visually reinforces the rear end's impression of stability and substance. In complete contrast to the customary proportions of an SUV, the Audi Q5 has a silhouette reminiscent of a coupe. This impression is created by the slender, sharply inclined A and D-posts and the early descent in the roof line; it is extended by a spoiler above the rear window, supporting the third brake light and most of the antennas. The vehicle body accounts for two-thirds of the overall height, with the greenhouse making up the remaining third – proportions that are typical for an Audi. The roof rails – taking the form of an aluminum extruded section – are standard, with a compact, elegant design that blends harmoniously into the overall styling. 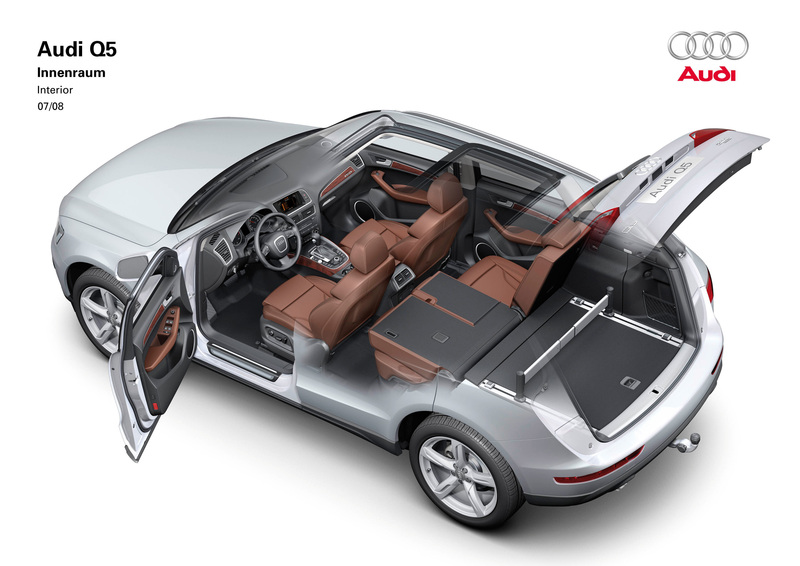 A zero-gap joint connects the roof and the side – this is a highly intricate feature calling into focus the high level of precision involved in Audi design and body manufacturing. The narrow, strictly parallel pattern of all body joins accentuates this impression. Substantial bow-type door handles, large exterior mirrors with LED turn indicators and prominent wheel arches point to the strength and sturdiness of the Audi Q5. Horizontal edges above the wheel arches recall the Audi quattro of 1980, one of the brand's classic creations. The Audi Q5 stands resolutely ready for action on its 17-inch to 20-inch wheels. Its long wheelbase of 2.81 meters (9.22 ft) means that the body overhangs are short – just 89 centimeters (35.04 in) at the front and 93 centimeters (36.61 in) at the rear. Like the front end, the rear of the Audi Q5 has a strongly expressive character; horizontal lines accentuate the impression of width. The bumper incorporates the rear fog lamps and the license plate area is recessed in the tailgate. Like the front lid, the wraparound tailgate is made from lightweight aluminum; it is exceptionally wide, like that of its big brother, the Audi Q7. The undivided rear lamps are mounted on the large tailgate; because they are not visible when the lid is open, the Audi Q5 has auxiliary lights in the bumper. 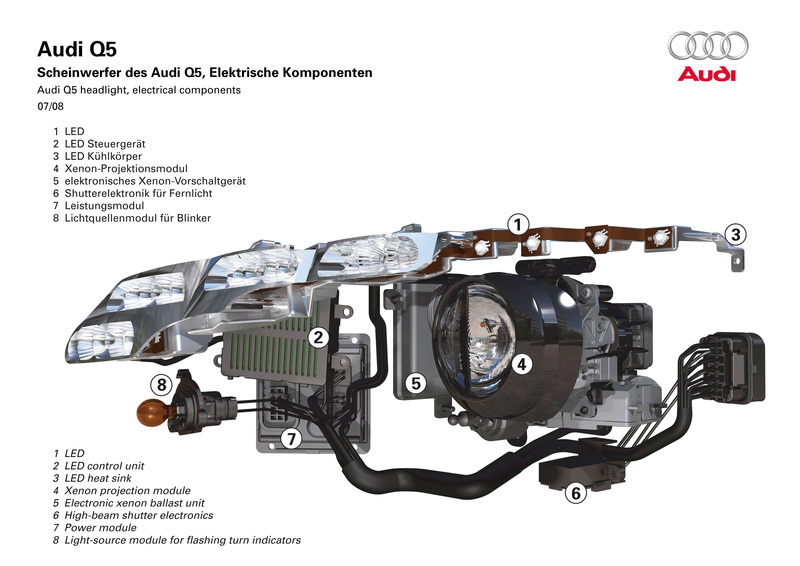 The main lamps have bulbs housed in separate chambers as standard; Audi additionally equips versions that have xenon plus headlamps with light-emitting diodes. An arc at the top edge of the lights acts as the turn indicator; in conjunction with xenon plus, below it there is a flat triangle of LEDs that dips slightly towards the outer edge, acting as the stop light. When the brakes are applied, the lighting intensity is increased sharply within a matter of milliseconds; a central light bar is also activated. In the event of an emergency brake application with more than 0.7 g deceleration, the Audi Q5 automatically activates the hazard warning flashers for three seconds. Audi offers three versions for exterior add-on parts, such as the lower sections of the bumpers and the door trim strips. They are colored black as standard, or painted in a contrasting color or the body color as an option. For stone damage protection, film is applied to the sills except around the jacking points. 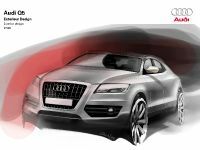 For customers who wish to customize their Audi Q5 even further, there is also a choice of two design packages. The S line exterior package gives the Audi Q5 an even more dynamic presence in the form of a distinctive grill design, new bumpers, accentuated air inlets, a spoiler lip and a diffuser insert at the rear. All exterior add-on parts and the door trim strips are painted in the body color, and S line logos adorn the fenders and door sill strips. The cargo area trim strip is in gleaming stainless steel, and trims give the exhaust tailpipes of the four-cylinder versions a more prominent look. The Offroad Style package gives the Audi Q5 a more gritty look. It comprises wheel arch extensions and special, partially dark-tinted bumpers. Beneath the nose and tail ends, there is an integral stainless steel underbody guard. Tailpipe trims and specially modified door trim strips complete the package. The wheels here are 19 inches in size, but 20-inch wheels are available as an alternative. 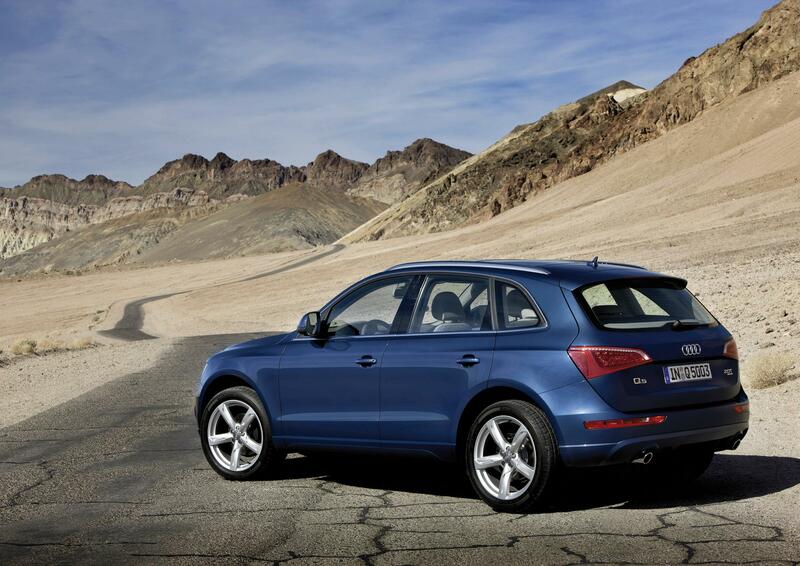 Q5 buyers can choose from an extensive range of body colors. There are the metallic colors Ice Silver, Quartz Gray, Amethyst Gray and Dakar Beige, the pearl-effect finishes Garnet Red, Phantom Black, Meteor Gray, Lava Gray, Stratos Blue, Deep Sea Blue and Orchid Gray, and the solid colors Ibis White and Brilliant Black. A high-gloss package highlights the windows with aluminum trims, and privacy glazing gives Audi's performance SUV an especially cool look with tinted rear windows. 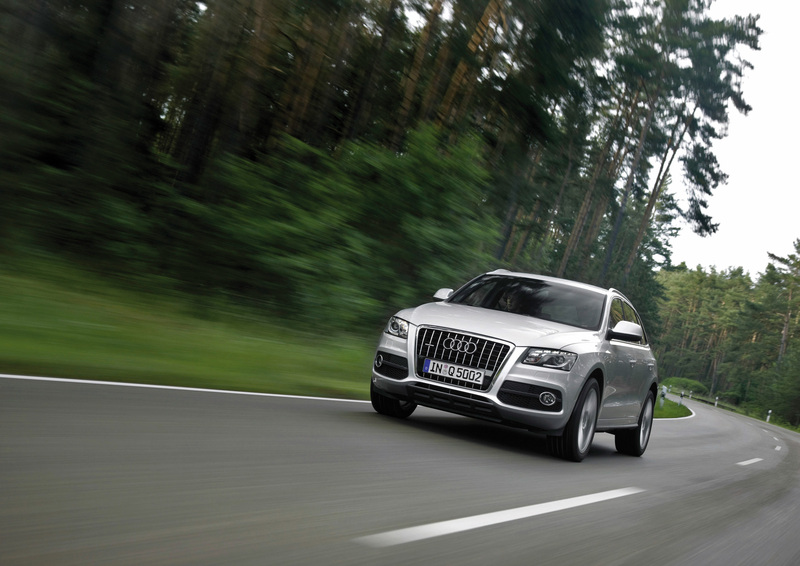 Good design is always functional design – the Audi Q5 has a drag coefficient of just 0.33, the best in its segment. This achievement is all thanks to intensive finetuning of the body and underbody. The frontal area of the performance SUV is 2.65 m2 (28.52 ft2). Elaborate aeroacoustics developed for the most part in a special acoustic wind tunnel keep the noise level low even when the car is traveling at high speeds. The Audi Q5 matches the exemplary standard of the Audi A4 in this respect. Influencing aeroacoustics involves juggling many different elements such as the triple door seals, the drip moldings on the A-posts and the exterior mirrors. Thanks to its rigid mount, the optional panoramic glass roof barely adds to the noise level. 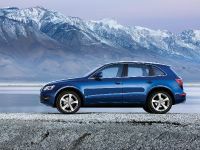 The basic weight of the Audi Q5 at market launch is 1,730 kilograms (3836.04 lb), a low figure for an SUV of this size. The steel body is very light in weight, thanks to the intensive use of cutting-edge technologies. The super-strength steels that reinforce the center tunnel, inner sills, B-posts, longitudinal members and bulkhead cross-member in the luggage compartment have tensile strengths as high as 1,600 megapascals. Six Audi Q5 cars together weighing ten metric tons could be hung from a strip of this hot-formed material only two millimeters (0.08 in) thick and 30 millimeters (1.18 in) wide. Hot forming is a hi-tech process. It involves heating blanks of boron steel to 950 degrees Celsius (1,742° F) in a conveyor oven and then quenching and shaping them in a cooled die. Their various zones can be heated to different temperatures in the oven, to produce a range of strength zones. In the event of a crash, the component is then deformed in precisely the desired manner. In the case of the B-post, for instance, the lower zone is rather more ductile (deformable) than the upper zone, since this is where most energy has to be dissipated in the event of a side-on collision. The post and the rear longitudinal sections are manufactured in-house; Audi is the first carmaker to have installed such production facilities. On the body of the Audi Q5 – minus the doors, lids and metal panels – superstrength hi-tech steels make up an impressive 9.1 percent of the overall weight. 3.3 percent is made from ultra-high-strength steels, 12.3 percent from higherstrength grades, 44.5 percent from high-strength steel and 30.8 percent from conventional deep-drawn steel. The way the body is put together is also a highly precise affair. The areas in which conventional resistance spot welding is used now account for only 73 percent of the total – equivalent to about 5,000 weld points. To boost strength further, Audi uses bonding in some areas as well as or instead of welding. A two-pack adhesive forms the join in 17 percent of cases; the adhesive seams in the Q5 measure a total length of 83 meters (272.31 ft). There are two particularly elaborate joining technologies among the remaining 10 percent. Laser welding is the method of choice around the sills and on the doors. 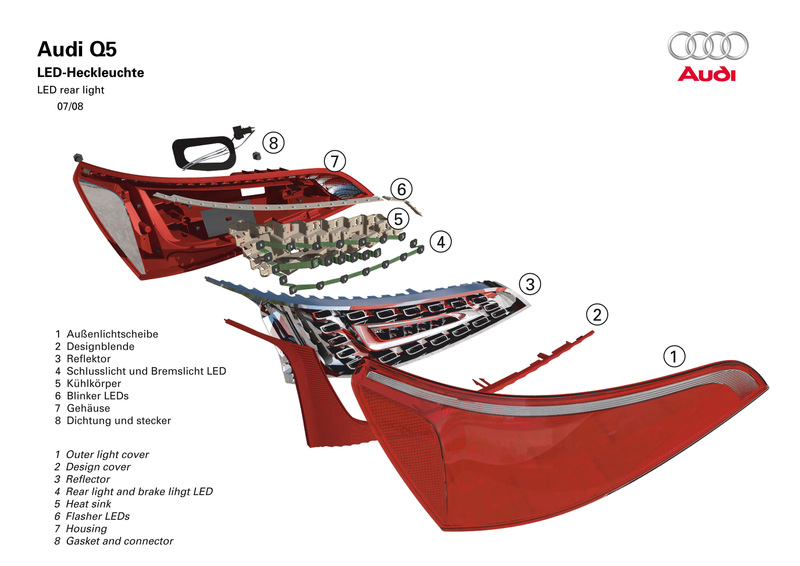 The components in the visible part of the tailgate's water channel, like the zero gap between the side section and roof, are created by hi-tech soldering methods. This zone is visible evidence of Audi's uncompromising quality philosophy, epitomizing the precision joins running all across the body. The use of ultramodern materials and joining techniques is the basis of the body's rigidity. It keeps the noise level on board low and paves the way for superb drivability – it is the basis for both low tire noise and sporty, precise handling. Achieving a homogeneous response by the entire body was one of the top priorities for global dynamic rigidity. The level of vibration was reduced even further at the "comfort points" at which the driver and passenger might detect vibration – the steering wheel, the floor panel, around the feet and seats – as well as around the mirrors. A highly advanced system of transverse and longitudinal profiles and frames gives the Audi Q5 high torsional rigidity. The longitudinal member, the center tunnel and the side structure provide outstanding flexural strength. Components such as a cross-member between the suspension-strut domes specifically increase the forward structure's rigidity. The design engineers also gave top priority to local rigidity. All those points at which forces and vibration are introduced during driving were specifically reinforced, such as the connection between the front axle subframe, suspension and body. The subframe distributes excitation from the wheels through a framework structure of longitudinal and tunnel members, thus significantly reducing tire noise in important zones. Long-term quality is again a top priority in the Audi Q5, in keeping with the brand with the four rings. To protect against corrosion, all body cavities are flooded with hot liquid wax. Audi is the only premium brand to implement this method. During testing of the performance SUV, the design engineers tested quality with the help of the "INKA test" (Ingolstadt Corrosion and Aging Test). This 19-week procedure involved exposing the Audi Q5 to every conceivable environmental load in a variety of chambers – salt spray, moist heat, dry heat and low temperatures down to -40° C (-40° F). This cycle was followed by a merciless shake test on a simulator and driving tests on the test track. 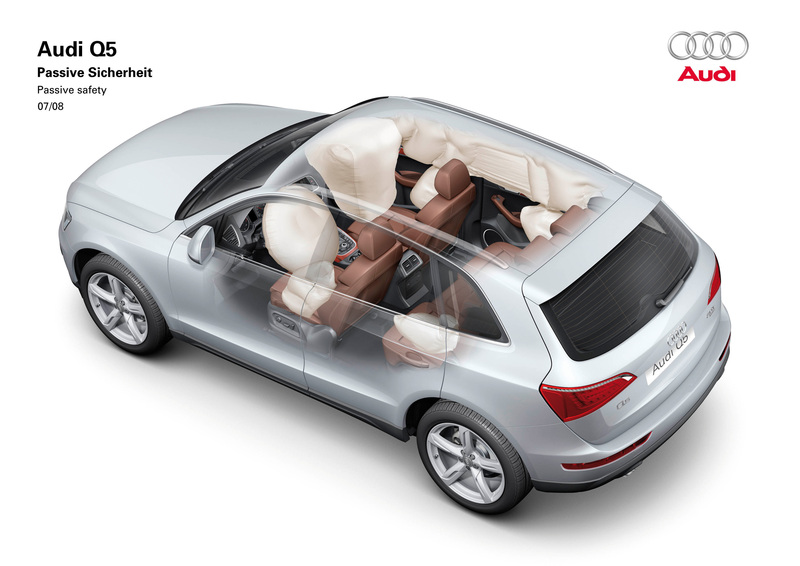 Occupant protection in the Q5 is also of the highest caliber and is a matter of honor for Audi. While developing the vehicle the brand was able to exploit the extensive resources of knowledge that it had built up internally. The AARU (Audi Accident Research Unit) exhaustively analyzes actual accident scenarios taking many different aspects into account. In a frontal collision, a finely choreographed series of protective measures is triggered off. At the very start of the collision two acceleration sensors located well forward, beneath the headlamps, are alerted first. The front cross-member distributes the forces arising through the upper and lower longitudinal members, which dissipate these through defined deformation. The aluminum subframe that supports the front axle and engine diverts the forces into the floor and tunnel structure of the occupant compartment. The steering column is pushed away from the driver and the pedals are disengaged from their mounts. In frontal collisions, people of slight build are at greater danger than sturdier people. Audi has therefore designed the restraint systems in the Q5 as an innovative, very closely meshed network. There are sensors on the front seat rails to detect how far forward or back the seat is positioned. This data is incorporated into the calculations of the control unit, which manages how the restraint systems operate. Because the computer knows how far the passenger is from the airbag, it can ensure that the amount of forward movement, during which the seat belt and the airbag can restrain the body, is optimally utilized. The front airbags in the Audi Q5, with a capacity of 64 liters (2.26 cubic ft) on the left and 120 liters (4.24 cubic ft) on the right, have an adaptive concept and operate according to a new strategy. They always inflate fully. If the impact is not particularly severe and the passenger is positioned close to the airbag, the control unit rates the situation as relatively mild. In this instance some of the inflating gas is released again through valves; the head and chest are cushioned relatively gently. If the crash is severe, on the other hand, the airbags remain fully inflated for longer. The same happens if the impact is not very strong but the passenger is sitting so far back that their torso would whip forward with great force. The conventional technology that triggers the airbag merely on the basis of a collision's severity would inflate the airbag only partially, affording correspondingly poorer protection. The belt force limiters, too, respond flexibly. They incorporate two torsion bars that are connected by toothed wheels. In less critical situations, the torsion bars are separated at an earlier stage in the accident. This gives the belt a greater range of movement – the seat occupant's upper body plunges relatively deeply into the airbag and the load that has to be withstood in the chest area is reduced. 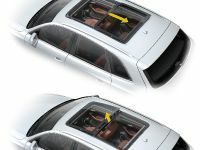 In a more severe crash situation, however, the torsion bars are either disconnected later or not at all – the seat belt restrains the passenger more firmly. Audi's developers also took intelligent precautions for rear-end collisions, a common type of accident in city traffic that can often lead to whiplash injuries. The longitudinal member, rear wheels and sills dissipate the impact energy in a specific pattern; the fuel tank is in the protected zone ahead of the rear axle subframe. The battery, car jack and optional entertainment equipment are displaced into a precisely defined zone; the fuel pump is shut down, as in any more severe crash. 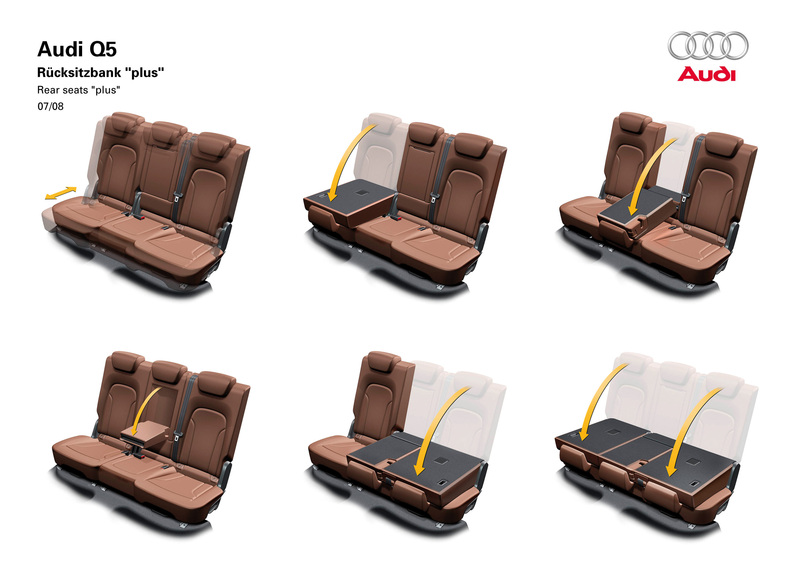 In the occupant compartment, the seats provide the passengers with excellent protection. The shape of the seat back frame, a soft sprung mat and an energyabsorbing foam enable the back to sink some way into the seat back. This allows the back of the head to be cushioned early on by the rigid head restraint, which is at a distance of only about four centimeters (1.57 in). In the case of a severe rearend collision, the seat-belt tensioners are triggered so as to firmly hold the occupants in the best position in their seats. This integral head restraint system, which is also used in other model series, has already proved effective for protecting passengers of any build in accidents of all levels of severity. It was awarded the rating "Good" in independent tests such as that conducted by the highly regarded International Insurance Whiplash Prevention Group (IIWPG), a work group that aims to prevent whiplash injuries. The U.S. Insurance Institute for Highway Safety (IIHS), too, awarded it the rating "Good". In Germany, the ADAC and leading trade periodicals arrived at similar results. 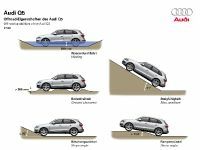 The Audi Q5 is also well equipped in the event of a side impact, in which the passengers are particularly exposed. Acceleration sensors in the C-posts and pressure sensors in the doors register the danger. The B-posts, the sills and two cross-members in the floor take on most of the deformation work. They are supported by the doors, the edges of which have a large overlap with the posts, sills and roof frame. Using their hinges, the door support members transfer the forces into the B-posts. 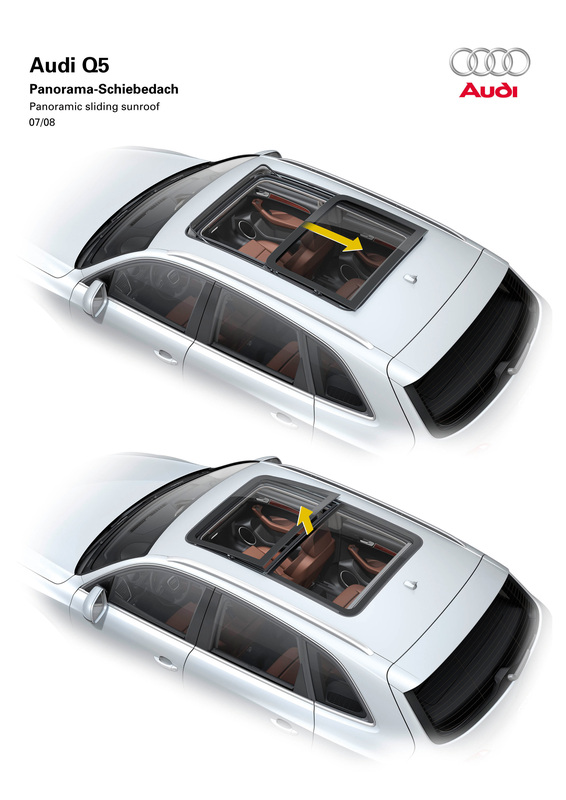 Inside the vehicle, protection in the event of a side impact is ensured by seatintegrated thorax/pelvis side airbags with a capacity of 13 liters (0.46 cubic ft) (optionally airbags with a capacity of 12 liters (0.42 cubic ft) on the rear seats) and continuous window bags with a capacity of 25.5 liters (0.9 cubic ft). Heightadjustable belts and anti-submarining ramps in the seats round off the restraint systems on the front seats; a sensor identifies whether the front passenger's seat is occupied. If the driver or front passenger have not fastened their seat belts when the car moves away, a warning gong sounds from speeds of 25 km/h (15.53 mph) upwards. 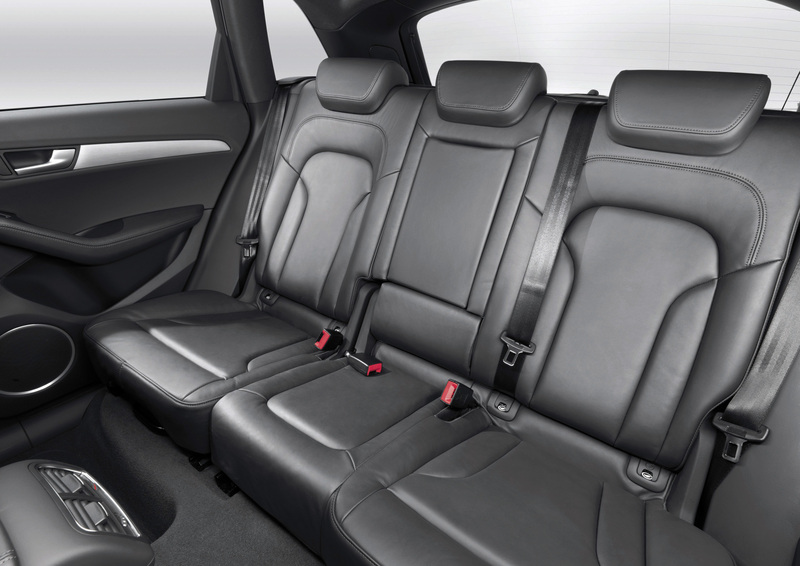 At the rear, the Audi Q5 is equipped with Isofix provisions for child seats as standard. Isofix catches can also be supplied optionally on the front passenger's seat, together with a disabling function for the airbag. Thanks to its spacious deformation space, the Audi Q5 meets all Japanese and European requirements for collisions with pedestrians. In the type-specific crash, which involves driving into a barrier at 15 km/h (9.32 mph) and a 40 percent overlap, crash boxes made from aluminum located ahead of the longitudinal members prevent damage to the body structure; the radiator can be displaced slightly to the rear thanks to its sliding mounts. Minor bumps of up to 4 km/h (2.49 mph) when maneuvering in parking lots do not leave any dents in the aprons, and after collisions at higher speeds these components can be changed individually. The Audi Q5 is the performance SUV for a dynamic, active clientele – it displays all the talents needed in a vehicle designed for sport, family and leisure use. Its target audience is people of a high level of education who attach importance to active leisure; many of them enjoy cycling or other sports. Audi Q5 customers view their car as an expression of their individuality and consequently attach great importance to attractive design, sportiness and performance. The cargo area is one of the Audi Q5's practical strengths. In its basic configuration it already offers a substantial 540 liters (19.07 cubic ft) of cargo space, which can be used very effectively. The floor is completely flat; the loading lip is only 69 centimeters (27.17 in) high and lies almost flush with the floor. The loading width is an impressive 105 centimeters (41.34 in) even between the wheel arches, and the loading length 93 centimeters (36.31 in). Four golf bags can easily be stowed cross-wise, and the maximum payload is a huge 580 kilograms (1278.68 lb). The capacity of the cargo area can be virtually tripled by a simple two-stage operation. The seat backs, divided 60:40, can be folded down with consummate ease. Preloaded by springs, they drop down by themselves onto the seat cushions and no further adjustments or removal procedures for the head restraints are required. This process is triggered by two mechanical release levers recessed in the side trims of the cargo area, operating by means of pull cables. If the levers on the seats are operated with the seat backs folded down, they come back up through about 45 degrees and can then easily be uprighted manually. The extended cargo area has a capacity of 1,560 liters (55.09 cubic ft) (loaded to roof height) and a loading length of 170 centimeters (66.93 in). It can be dramatically increased yet again by the convenient option of a folding front passenger's seat, with special kinematics to fold its seat back down forwards. The cargo area is rendered even more versatile with another option, the rear seat bench plus. This can be slid forward by 10 centimeters (3.94 in) and also incorporates a large load-through hatch. The seat back of the slightly narrower center seat (40:20:40) is designed to fold down individually. The trunk lid is released electrically by a pushbutton and pivots high enough up to allow even tall people to stand under it without bumping their heads. For ease of closing there is a continuous strip handle that is within immediate reach. Audi is able to supply an electrically powered trunk lid as an option. Audi's engineers gave the Audi Q5 an array of other ingenious details to equip it for the diverse challenges of everyday use. These include a 12V power socket on the right side panel of the cargo area, two lights, two folding bag hooks and four lashing eyes in the floor. These are made from solid metal and chrome-plated. The precision with which they can be moved is another example of Audi's uncompromising standards of quality. These standards are also evidenced by the cargo area's plush trim: the entire compartment is lined in exclusive carpeting. The additional storage levels are also a handy idea. The two-piece floor can be folded up to reveal a finely trimmed additional compartment about 18 centimeters (7.09 in) deep. This can accommodate a dirt-resistant tray that is ideal for storing wet or dirty objects such as running shoes or ski boots. Its size depends on whether the Audi Q5 is equipped with a hi-fi system with subwoofer or folding wheel, or alternatively the space-saving standard tire repair kit. If the Audi Q5 customer has ordered the optional storage package, there is a large storage net suspended from the underside of the rear shelf. This package also includes a sliding net for the recess in the right side panel of the cargo area. A sturdy partition net in the cargo area is included in the standard specification. It can be secured at various points, depending on whether the rear seat backs are upright or folded down. Other options available include the rail system with load-securing set, a system of rails in which a telescopically extending rail and a spring-loaded strap can be engaged, to divide up the compartment flexibly. A reversible mat and a removable bag for skis and snowboards complete the range of optional items for the Audi Q5. The optional trailer tow hitch can be pivoted out and light-emitting diodes indicate whether it is correctly locked in position. The accessories range includes various racks for transporting bikes, canoes, surf boards and skis on the roof. Feeling at ease straightaway is a typical response whenever you climb into a new Audi. 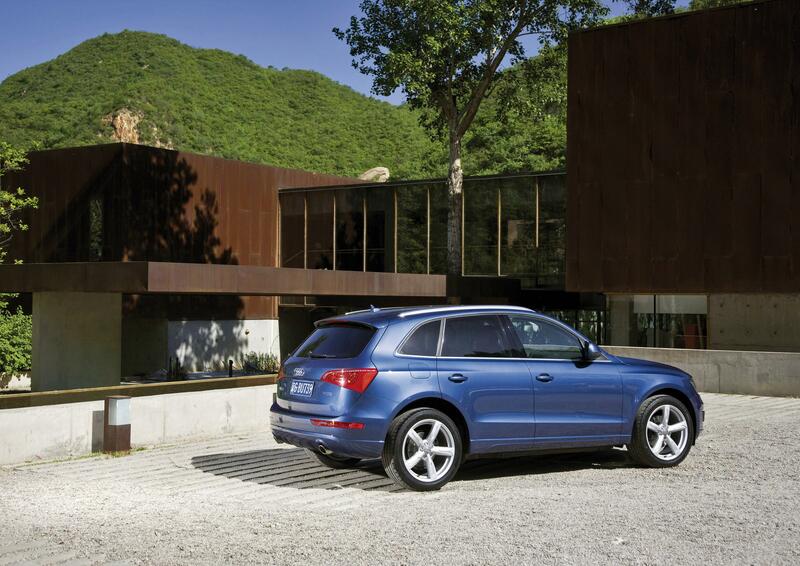 The Q5 is no exception; its developers have created a light, luxurious and spacious interior. It is elegant in appearance, the build quality is of the customary superb standard, and the intuitive ease with which it is controlled can be further enhanced with numerous hi-tech features from the full-size category. In the Audi Q5, the driver's seat is one of the keys to that sense of well-being. It is amply dimensioned, so that drivers of all heights and builds will feel instantly at ease on it. The driver's and front passenger's seats give their occupants an ergonomically excellent position and provide perfect body support – even though the Audi Q5 driver is half as high up again as a driver of a conventional car, the seated position is still sporty. The seats are height-adjustable as standard, and their head restraints may be moved well up. Audi offers the option of sport seats with manual angle adjustment, extendable thigh rest and electric four-way lumbar support – this latter feature can also be ordered separately. Alternatively all-electric seat adjustment is available, for adjusting the fore/aft position, seat back angle and height. A memory function that remembers the preferred seat and exterior mirror positions is also available. With typical Audi thoroughness, the optional heated seats have six settings. The system heats the seat bases and backs, and also the sides on leather and sport seats. The outer rear seats can also be supplied with heating. The climate-controlled comfort seats at the front are the ultimate luxury – they are the top-end version in the seats range for the Audi Q5. Each seat back and base cushion has two small fans with six power settings. To prevent chilling of the occupant, there is a supplementary function that cuts in automatically if need be. The climate-controlled comfort seats are upholstered in perforated leather. All seat versions have neatly and carefully stitched seams – their very design inspires confidence in their quality. The sport seats are very elaborately topstitched. Orange-colored seams on the standard seats, upholstered in black fabric, give the interior a note of youthful freshness. An extensive range of design packages is available. These include Havanna cloth upholstery or the leather grades Milano and Fine Nappa for the standard seats; these come in a range of five colors. The sport seats are upholstered in Micro cloth or the leather types leather/Alcantara, Milano and Fine Nappa; here again, the customer has a choice of five colors. The Audi Q5's colors and equipment, too, have a sporty, elegant character. The vehicle's interior is visually harmonious in black, gray or beige. This philosophy creates a light interior impression in which the inlays provide visual highlights. The standard version is in Micrometallic platinum, a metallic-effect paint finish, or optionally in aluminum or the woods Walnut brown or Fine grain ash almond beige. On the version Fine grain ash brown, the wood's pores remain open and thus allow the natural material's structure to be explored by the fingertips. The headlining is in beige, black or silver and can be supplied optionally in Alcantara; the sill strips are in a contrasting aluminum look. With the optional leather package, the instrument hood and armrests are trimmed with Fine Nappa leather in a choice of five colors. In the chrome package, components such as the air vents and light switches acquire a sophisticated gleam. The S line sport package creates even more sporting individuality. As well as 19-inch or 20-inch wheels, the special body colors Daytona Gray and Monza Silver, and sport suspension, it includes a whole array of distinctive individual details inside the vehicle. The interior and headlining are in black, with a choice of black or silver seams. The upholstery of the sport seats – in cloth/leather, Alcantara/leather, Milano leather or Fine Nappa leather – features special S line embossing. The inlays are in matt aluminum (or optionally piano finish). The leather sport steering wheel is emblazoned with the red and silver S line badge, and the gear knob is trimmed in perforated leather. Sill strips with S line logos and a stainless steel strip for the cargo area complete the package. The Q5's interior systematically echoes the exterior design and is an authentic example of Audi's design philosophy. Devoid of any angular SUV elements, it exudes a predominantly sporty, flowing character and the cockpit is elegantly structured. A complex surface design of bold lines framing taut surfaces underscores the progressive dynamism of the Q5; its clearly arranged zones convey the power and agility that is the very essence of Audi's performance SUV. In the door trim, for instance, the opener, inlay, armrest and storage compartment constitute a functional unit of high aesthetic quality. The interior of the Audi Q5 is a haven for the senses. Meticulously chosen and crafted materials and the varied tactile charm of the surfaces are combined with Audi's elegant design language. In the zone around the on-board monitor, for example, there are three different trims, all of which are precisely coordinated. They are in gleaming chrome, with a matt surface and in semi-crystalline plastic. The brand with four rings has long enjoyed proverbial renown for its quality standards – but this would not have been possible without concentrated hi-tech. Audi no longer uses textile strips for acoustic isolation on the backs of the monitor and instrument cluster. This task is now performed by a new type of foam that reliably suppresses cracking and creaking noises. 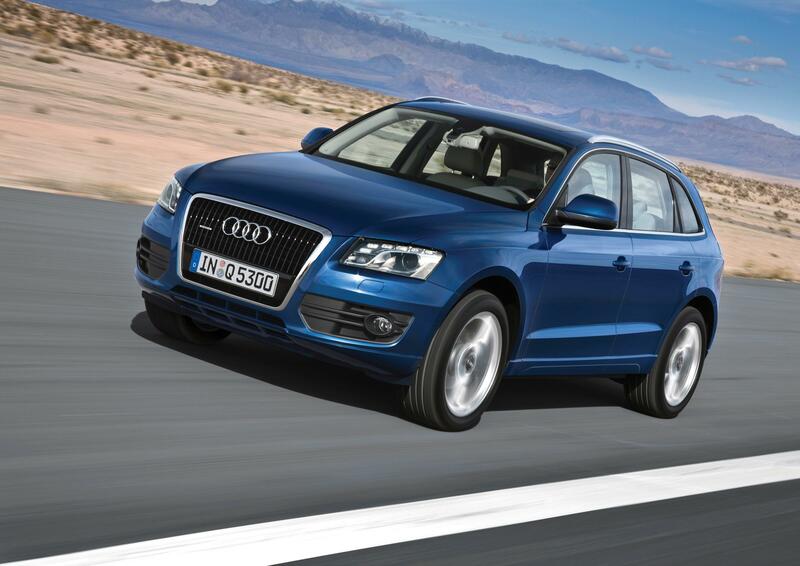 Many details on the Audi Q5 echo the large model lines – it possesses all the finesse of a luxury sedan. Its rotary controls operate with clockwork precision, with a gentle click – the sound of technical perfection. Red and blue diode semicircles on the user interface of the deluxe automatic air conditioning indicate the temperature ranges. The buttons, with their elegantly rounded corners, engage with defined force and short travel. There is an optional lighting package that illuminates the interior with discreet highlights. The sense of well-being that the interior of the Audi Q5 creates is underpinned by the perfect ergonomics for the driver. The sportily short gear knob is positioned such that the driver's hand finds it intuitively, and the distances and angles of the steering wheel and pedals are perfectly matched. The steering wheel has 60 millimeters (2.36 in) of manual reach and 44 millimeters (1.73 in) of height adjustment, with electric-motor locking. The steering wheel has four spokes as standard, or there are alternatively the options of a leather multifunction sport steering wheel with three spokes or a leather multifunction steering wheel with three spokes. It has small drum-type and pushbutton controls for the basic functions of the navigation system, radio system, car phone and speech dialogue system; these are elegantly framed with narrow chrome surrounds. On the Q5 with the new seven-speed S tronic, Audi can also supply two shift paddles that are located behind the steering wheel rim. All functions in the Audi Q5 are focused on the person at the steering wheel. The instrument cluster and the center console, which is subtly inclined toward the driver, form a single unit. The teardrop-shaped surrounds of the speedometer and rev counter are typical Audi elements. The driver information system is between the two large, easy-to-read instrument dials – ideally positioned in the field of view. On the Audi Q5 2.0 TDI, it also includes a shift indicator that shows the optimum gear by way of a recommendation. The standard display is monochrome, but a high-resolution color version is available as an optional extra. The Audi Q5's standard specification includes a second large display. It too is positioned so that it is extremely easy to see, in the upper part of the center console, level with the instrument cluster. A monochrome 6.5-inch monitor presents information from the audio and air conditioning systems and adjustment options from the CAR menu, in which the customer can configure details such as the lighting and locking functions themselves. The large switches and buttons of the audio system are located within ideal reach between the climate control system and air vents. If the Audi Q5 is equipped with MMI navigation plus, the controls for the audio system are moved to the MMI (Multi Media Interface) operating system on the center tunnel. Praised in countless tests by industry media, the MMI has long since proven itself to be a superior solution. Audi has now improved it yet further: the central rotary control/pushbutton incorporates a cap that can be operated like a joystick – for even quicker and easier navigation on the monitor. Logically arranged buttons and a volume control are grouped around the central control. They are used to control the functional areas navigation, media, information, CAR menu, setup, telephone, directory and radio functions by an operating principle that can be picked up intuitively. All information appears on the large monitor; in combination with the hard-drive navigation system, this is a color screen measuring seven inches diagonally. Very close to the MMI controls there is another large switch that operates the electromechanical parking brake. Like a mechanical handbrake, it prevents the car from rolling away, but also incorporates a number of other functions. The integral starting assist function releases the brake at just the right moment, and prevents the car from rolling back when starting on an uphill slope. 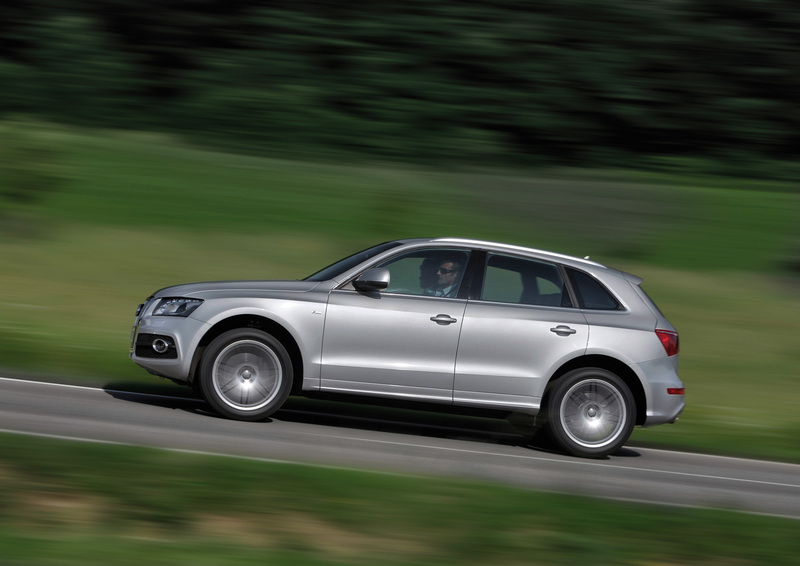 Thanks to an emergency braking function, the Q5 can still be slowed down even if the conventional brakes should fail – at 8 m/s2, almost as effectively as in an emergency stop. If desired Audi can supply a further function to complement the electromechanical parking brake: Audi hold assist. It comes to the driver's assistance when the car is stationary on an uphill or downhill slope by holding the Audi Q5 by means of small pulses from the hydraulic brake system. The driver does not even need to push a button to drive off again; releasing the clutch is sufficient. The Audi Q5 is fitted as standard with automatic air conditioning with a pollen and recirculated-air filter, plus a function that builds the sun's position into how it operates. A powerful blower circulates large quantities of air. Typically for Audi, the innovative system is quiet, powerful and efficient. And it is remarkably light in weight. The optional deluxe automatic air conditioning has even more features – it regulates the temperature, volume and flows of air in three separate zones for the driver, front passenger and rear passengers. A responsive moisture sensor minimizes the risk of window misting, and separate outlets on the top of the dashboard provide low-draught indirect ventilation. Another optional item on offer from Audi is auxiliary heating, which can be radio-controlled or programmed via the MMI operating system. The Audi Q5's remote control key does not have a bit: to start the engine, it is simply pushed into the ignition lock with the clutch or brake pressed. The intelligent key memorizes settings and service information to facilitate the checkin process when the car is taken for servicing. With the luxury convenient key version, it does not even need to be taken out of the user's pocket; the engine is started and stopped at a button on the center console. The locks are released by the sensor as soon as the driver touches a door handle or the cargo area release button, and secured again by briefly pressing the sensor. The interior of the Audi Q5 is like a perfectly tailored suit – it is airy but cut to fit perfectly. The statistics prove how spacious it is: the shoulder width is 1,465 millimeters (57.68 in) at the front and 1,432 millimeters (56.38 in) at the rear. The Audi Q5 also has an exceptional amount of headroom at the front –1,043 millimeters (41.14 in). Even tall passengers will find the rear compartment amply spacious. The seats provide a sporty standard of comfort at head, elbow and knee level; there is space for the feet under the front seats. The seat back angle can be adjusted as standard between 24 and 30 degrees. The long door cutouts, the wide opening angle of the doors and the low sills maximize ease of access to the rear of the Audi Q5. The holders in the doors can even accommodate large 1.5 liter (3.17 pint) bottles. A fold-out center armrest provides comfortable arm support, and optional nets are available for the backs of the front seats. A versatile feature is the rear seat bench plus; the sections of the 40:60 split bench can be slid forward or back independently by 100 millimeters (3.94 in). Its center armrest incorporates two pull-out cup holders. Other extras are manual blinds for the side windows – a feature that will be particularly appreciated by children when out and about in the summer. There are numerous convenient features up front, too. The spacious door pockets have brackets that are also suitable for large bottles. Then there are two more cup holders on the center tunnel. One of them can be supplied with a thermal function. An electronic-control peltier element – an electro-thermal converter similar to the principle found in a cool bag – operates in tandem with a fan. At the push of a button it cools or heats the inside of the thermal cup holder across a range from 3 to 58° Celsius (37.4 to 136.4° F). A small display serves as a visual reminder for the user when the cup holder is hot. The front center armrest is a particularly comfortable option – it can be adjusted lengthwise by 6.5 centimeters (2.56 in) and to four different heights. As standard it conceals a storage compartment that has space for up to eight CDs. The unit has a soft foam exterior and is particularly large thanks to the absence of a handbrake, instead of which there is the electromechanical parking brake. An eyewear compartment in the inside lights module of the headlining, a clip for car park tickets on the sun visor, a large glove box optionally with air conditioning and two 12V power sockets – one on the center tunnel and one in the rear compartment – are other practical ideas for everyday convenience. Audi can supply a storage package on request. This comprises a net on the right of the center tunnel, two compartments beneath the front seats, nets on the reverse of the front seat backs, a net on the underside of the rear shelf, a luggage spider on the floor of the cargo area, a lockable glove box and a multi-fixing point in the right footwell which can also be exchanged for other fastening elements. The accessories range includes a storage box, an umbrella holder and other similar items. Gasoline direct injection, badged as FSI, is a competition-beating technology, especially when paired with turbocharging. 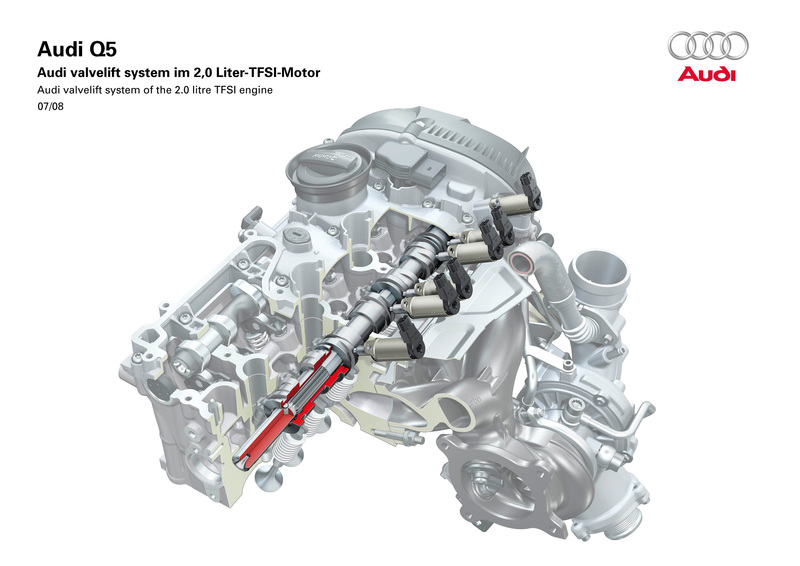 On the 2.0 TFSI, a newly developed common rail system injects the fuel directly into the combustion chambers at a pressure of 150 bar through six-hole injectors; flaps in the intake tract induce a specific swirl pattern. The temperatures are reduced by its evaporation, overcoming the age-old problem of turbo technology – the high amount of heat it generates and therefore the tendency to knock. 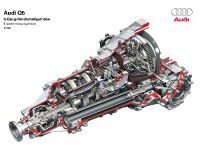 Despite the presence of turbocharging, Audi's engineers achieved a high compression ratio of 9.6:1 that plays a big part in its combustion efficiency. 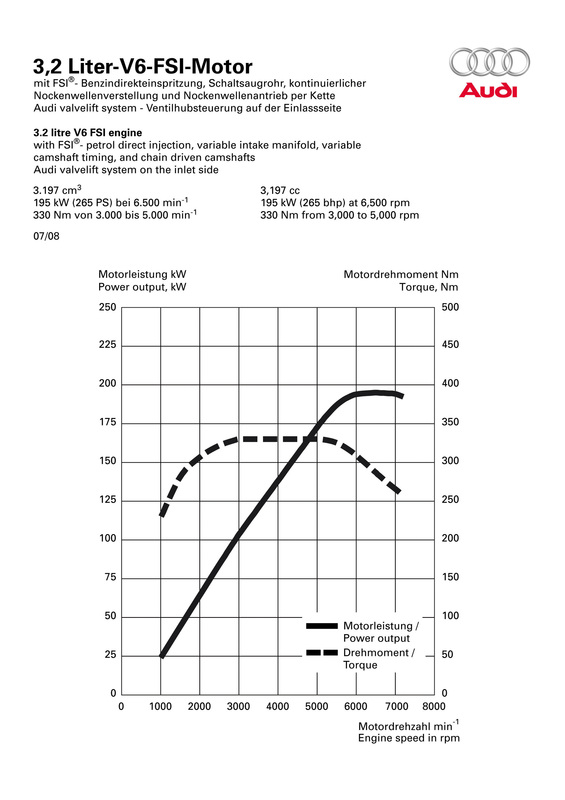 Audi's gasoline direct injection concept first supplied evidence of its potential in June 2001. It was then that a TFSI engine powered the Audi R8 sports prototype to overall victory in the Le Mans 24 Hours; 64 more victories out of 80 starts followed in subsequent years. This technology notched up a string of successes in road cars, too – the 2.0 TFSI has been voted "Engine of the Year" four times in succession by an international jury of journalists since 2005. The new 2.0 TFSI in the Audi Q5 is the successor to this winner; Audi has thoroughly reengineered it, while retaining the same basic dimensions. Like its predecessor, it has a displacement of 1,984 cm3. Its two balancing shafts in the crankcase compensate the free second-order inertial forces and lead to refined running with very low vibrations. All components have been optimized for minimal friction, above all around the cylinder bores and conrod bearing shells. The oil pump operates with volume-regulated delivery and two-stage pressure control, which likewise reduces fuel consumption. When it comes to turbo technology, the 2.0 TFSI again represents the state of the art. A water-cooled charger increases the filling of the cylinders with air; optimized turbine and compressor wheels have improved its response. The intercooler is another new development; it combines a high degree of efficiency with low weight and compact dimensions. The two-liter TFSI engine is equipped with the new Audi valvelift system that regulates the valve lift variably in two stages. Unlike on the 3.2 FSI in the Audi A6, here it acts on the exhaust valves. Together with the intake camshaft that can be adjusted through 60 degrees, it improves the charge cycle and further boosts pulling power. The driver experiences the AVS system as a technology designed to enhance driving fun – it guarantees a spontaneous, dynamic torque buildup. The 2.0 TFSI realizes a sporty performance of 155 kW (211 hp) and 350 Nm (258.15 lb-ft) of torque, the latter from as low as 1,500 rpm right up to 4,200 rpm. The two-liter power unit accelerates the Audi Q5 from a standstill to 100 km/h (62.14 mph) in 7.2 seconds, and on to a top speed of 222 km/h (137.94 mph). The 2.0 TFSI achieves astonishingly good fuel efficiency, managing 100 kilometers on 8.5 liters (27.67 US mpg). Its high torque allowed the developers to extend the transmission ratio somewhat – an important factor in the efficiency concept. 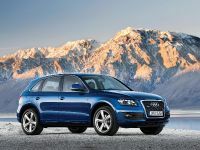 The new 3.2 FSI will step into the role of top gasoline engine in the new Audi Q5 at the start of 2009. It combines a whole raft of hi-tech features – the innovative Audi valvelift system for valve control, FSI gasoline direct injection and a variety of measures to reduce internal friction and therefore further enhance efficiency. The 3.2 FSI develops 195 kW (270 hp) from a displacement of 3197 cm3, and its ample maximum torque of 330 Nm (243.40 lb-ft) is achieved constantly from 3,000 to 5,000 rpm. It accelerates the Audi Q5 3.2 FSI from 0 to 100 km/h (62.14 mph) in approximately 6.8 seconds (provisional figure) and on to a governed top speed of 232 km/h (144.16 mph). This impressive power flow is achieved on exceptionally little fuel – consumption reaches only approximately 9.3 liters/100 km (25.29 US mpg) on the 3.2 FSI with manual transmission (provisional figure). The Audi valvelift system has played a major part in this progress in fuel efficiency – the new valve control technology reduces fuel consumption by a good five percent. The Audi valvelift system, where valve lift is controlled variably in two stages, assures excellent filling of the combustion chambers in every situation. It regulates the amount of air drawn in when the intake valves open; the throttle valve can usually remain fully open, thus largely eliminating undesirable throttling losses. The engine is able to breathe freely, and achieves higher output and torque on less fuel. For almost 20 years, Audi's TDI engines have been setting the standards in their field. 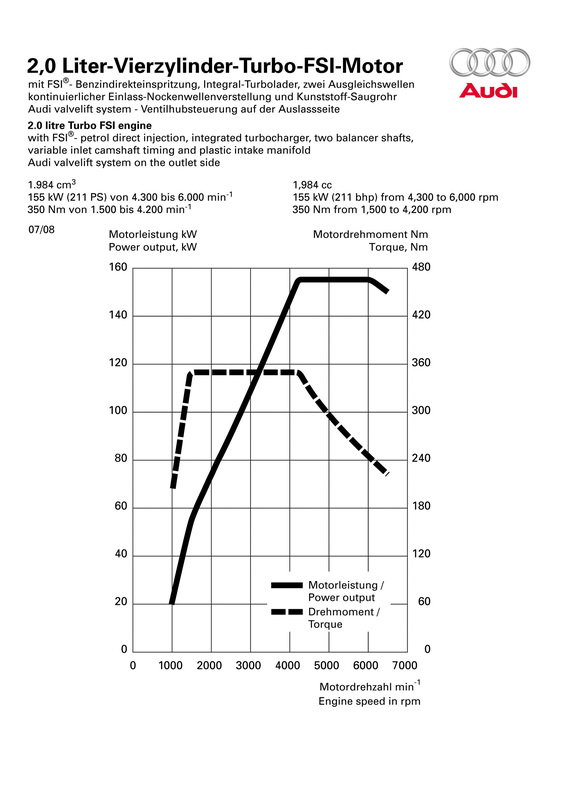 In 1989 Audi introduced the TDI principle, and since then the brand with the four rings has steadily extended its lead. With their high torque, good fuel efficiency and quiet, refined running these diesel concepts create a harmonious and convincing overall impression – a modern, smart form of sportiness. In the three victories of the R10 racing car at Le Mans from 2006 to 2008, Audi has demonstrated what power the TDI harbors. 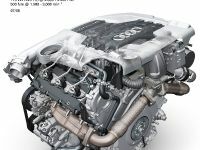 The V6 TDI engine in the Audi Q5 is from the Audi V engine family, which features a 90-degree included angle between the cylinder banks. Its compact engine block is made from light but very strong vermicular graphite cast iron. Intensive fine tuning measures have minimized friction losses: the pistons are fitted with optimized rings, and the chain drive for the camshafts and the injection pump have also been intensively revised. The new oil pump with volumeregulated delivery draws much less power from the engine than its predecessor component. The third generation of common rail systems with eight-hole nozzles is used. The high pressure of up to 1,800 bar – equivalent to the entire weight of a car resting on a surface the size of a finger nail – assures extremely fine atomization of the fuel and therefore precise mixture formation and combustion. 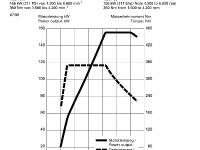 The injectors use the piezo principle, which applies an electrical voltage to a ceramic element. This alters its crystalline structure; the material's expansion is translated into movement that operates the injector needles. The injectors are extremely fast-acting and close again within one to two milliseconds, thus permitting minute injection quantities of just 0.8 of a milligram. They can vary the number of injection processes per operating cycle across a wide range; up to five injection operations are possible. This strategy reduces emissions and produces a smooth combustion process, so that the engine's noise pattern is also more satisfactory. 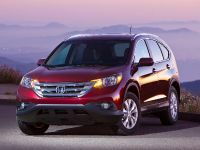 The three-liter diesel is the best performer in its class in terms of refinement. 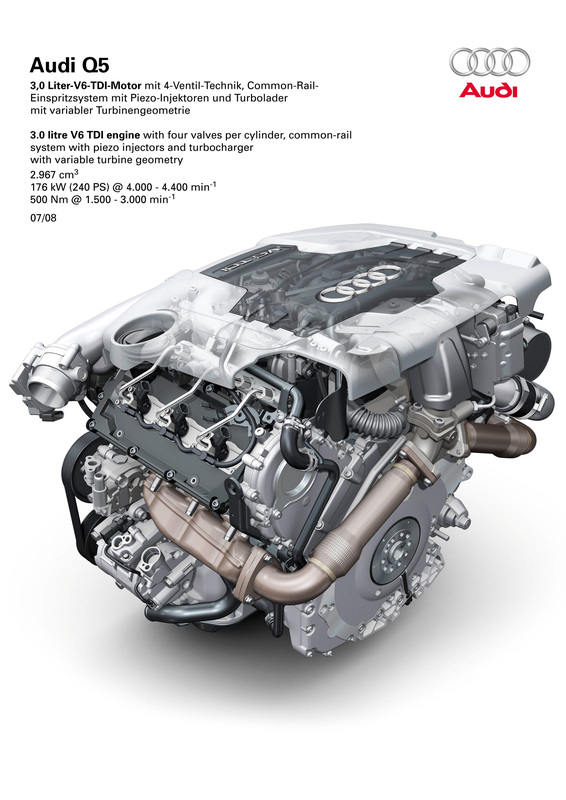 The 3.0 TDI uses the latest design of VTG turbocharger, with variable turbine geometry. In the interests of a spontaneous torque buildup, a fast-acting electric actuating motor adjusts its vanes. The intercooler, also a new feature, is installed transversely ahead of the radiator in an ideal position for optimal cooling, and has a high thermal efficiency rating. Cooling of the compressed air increases the level of oxygen required in the cylinders for the combustion process. The modified 3.0 TDI is notable for its particularly clean exhaust emissions – it already provisionally complies with the limits of the future Euro 5 standard. A new concept for the recirculation of cooled exhaust gas drastically reduces emissions of nitrogen oxides. A diesel particulate filter is used to reduce soot emissions: it cuts the already low level of untreated emissions further, by more than 90 percent. The filter is located close to the engine, so only a small amount of heating energy is required for its regeneration. The three-liter diesel develops 176 kW (240 hp). Its peak torque is an impressive 500 Nm (368.78 lb-ft); the driver has this on tap right across the range from 1,500 to 3,000 rpm. This is the key to the surge of power – a wave on which the car, like a surfboard, is carried forward in a relaxed, carefree way. The powerful TDI with an engine capacity of 2,967 cm3 accelerates the Audi Q5 from 0 to 100 km/h (62.14 mph) in only 6.5 seconds and reaches a top speed of 225 km/h (139.81 mph) – at an average fuel consumption of only 7.7 l/100 km (30.55 US mpg). When engines are developed, the demands for higher power, lower fuel consumption and reduced pollutant emissions normally all clash with each other. However, with the reengineered version of the 3.0 TDI Audi has made progress with all the main parameters despite their conflicting nature – further evidence of the brand's leading position in the TDI sector. 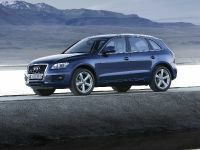 The second diesel in the Audi Q5, the 2.0 TDI, operates even more efficiently than the three-liter version. Its average fuel consumption is a mere 6.7 liters per 100 km (35.11 US mpg). With a displacement of 1,968 cm3, the four-cylinder unit is a new interpretation of the TDI concept's outstanding qualities. It builds on the characteristic strengths of its predecessor – the world's most-built diesel engine – and offers customers even more driving fun, economy and refinement. The area in which decisive progress has taken place is the cylinder head, where two camshafts operate 16 valves. Common rail injection controlled by one of the most modern engine management systems on the market supersedes the previous pump-injector units. The 2.0 TDI, too, has modern piezo injectors with eight-hole nozzles; the finely modulated process of up to five injection operations per operating cycle drastically reduces the noise level. The single-piston high-pressure pump develops a system pressure of 1,800 bar. The acoustics of the toothed belt drive have also received attention, with additional noise-reducing structures on the belt cover. As on the previous engine, two balancing shafts reduce the vibration generated by the crankshaft and reciprocating parts. Various modifications were made here and at the oil sump because the 2.0 TDI is installed in the Audi Q5 inclined 20 degrees to the right. Other special features improve the performance of the four-cylinder engine, which has a compression ratio of 16.5:1. Its turbocharger has variable vanes for a swift torque buildup; a pulsation damper reduces its vibration. Electric motors control the position of the swirl flaps in the intake manifold to adapt the incoming airflow continuously to the prevailing engine load and speed. 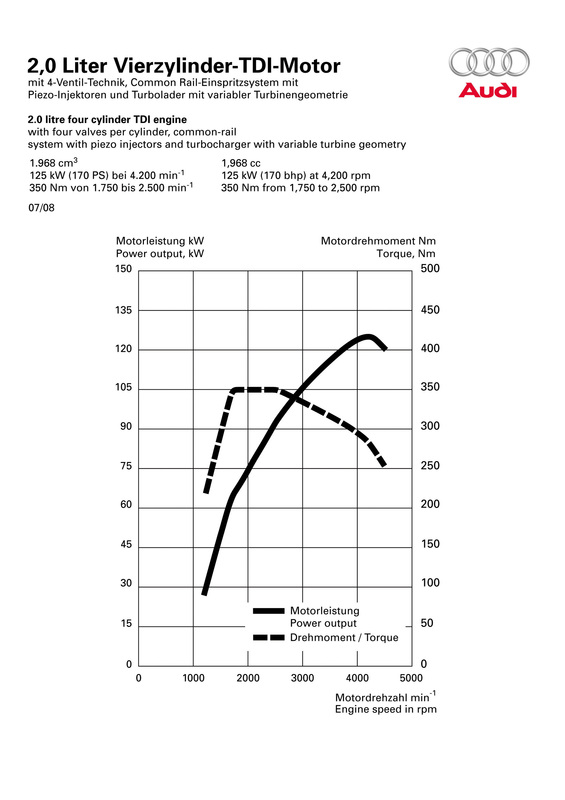 Optimized intake-air management and modified piston geometry result in a high maximum engine speed of 5,000 rpm and improved combustion chamber thermodynamics. They enable the two-liter TDI to operate with an exhaust gas recirculation rate of up to 60 percent; this means combustion takes place at a lower temperature and oxygen level, reducing the untreated emissions of nitrogen oxides. The EGR (exhaust gas recirculation) system achieves a high cooling performance. The refined 2.0 TDI unit produces 125 kW (170 hp) and applies a full 350 Nm (258.15 lb-ft) of torque to the camshaft at engine speeds of 1,750 to 2,500 rpm. This is ample for accelerating the Audi Q5 to 100 km/h (62.14 mph) in 9.5 seconds and for giving it a top speed of 204 km/h. The drivetrain is an area of innovation in which Audi is particularly well placed to demonstrate its prowess as a leading player. When the Audi Q5 concept was being defined as the sportiest SUV on the market, it was clear right from the start that there was only one principle in the running: quattro permanent all-wheel drive. The transmission technology is utterly new and innovative: the 3.0 TDI and the 2.0 TFSI have the new seven-speed S tronic as standard; the 2.0 TDI is combined with a six-speed manual transmission as standard. 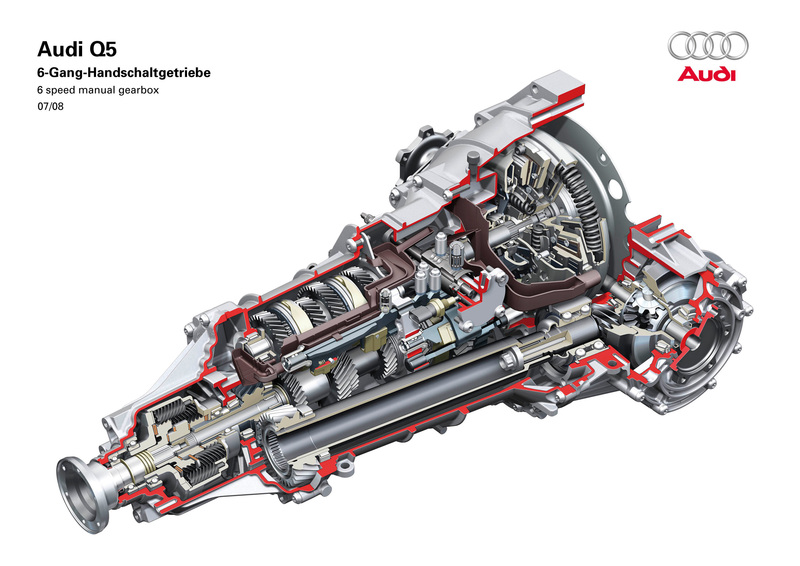 The dual-clutch transmission is a brand new development from Audi, a hi-tech component that is both dynamic and highly efficient. 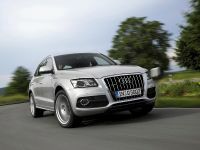 Audi Q5 drivers can use the new seven-speed S tronic in various modes. The fully automatic mode, in which the control unit determines the gearshifts, offers the D (Drive) and S (Sport) programs. The driver of the Audi Q5 can also change gear manually with the selector lever or with the optional shift paddles on the steering wheel – an amazingly fast affair. The gearshift feel is dynamic, comfortable and very precise – typically Audi. The seven-speed S tronic is composed of two transmission structures. It integrates two multi-plate clutches that control different gears. The large K1 clutch located on the outside directs the torque via a solid shaft to the gear wheels for the oddnumbered gears 1, 3, 5 and 7. These are located in the rear section of the cast aluminum transmission casing. A hollow shaft rotates around the solid shaft. It is connected to the smaller K2 clutch, which is integrated into the inside of its larger sibling, and which controls the gear wheels for the even-numbered gears 2, 4 and 6, as well as reverse gear. All gear wheels are arranged one behind the other on both output shafts, in the order 4, 6, 2, R, 1, 3, 7 and 5. Both transmission structures are continuously active, but only one is connected to the engine at any one time. For example, when the driver accelerates in third gear, the fourth gear is already engaged in the second transmission structure. The shifting process takes place as the clutch changes – K1 opens and K2 closes. The gear change takes only a few hundredths of a second and is completed without interrupting traction. It is so fluid and smooth that the driver hardly notices it. The power flows from the output shaft to the self-locking center differential of the quattro drivetrain, which distributes it in two directions. In the basic distribution, 60 percent of the torque flows via the propshaft to the differential for the rear axle, and 40 percent flows via a side shaft to the bevel gear of the front-axle differential. Because this shaft is installed at a 7.2 degree angle, it uses a slanted, beveloid gear. To reduce weight, it is also hollow. When needed, the center differential can deliver up to 85 percent of the power to the rear axle or a maximum of 65 percent of the power to the front axle. Each component of the new seven-gear S tronic attests to Audi's uncompromising quality standards. Carbon-coated synchronizer rings guarantee synchronization of unsurpassed quality and stability. The gears one through three and reverse are also designed as three-cone synchronizations. High-precision management of the two multi-plate clutches was one of the key aspects of the specifications manual. Audi achieved this by means of compact pressure cylinders, electronically controlled speed equalization, and optimized coil spring assemblies. This technological package provides maximum precision and comfort for moving off and shifting. The transmission is managed by the so-called mechatronic module. This module consists of a compact group of control units and hydraulic control valves that is integrated on the left of the transmission, looking in the direction of travel. Its control function allows it to vary the speed of the gear shifting process and to control the power necessary for the process extremely precisely. The control pressure is generated by an efficiently operating oil pump that is located next to the mechatronic module and is driven by a gear stage. It is supported by a vacuum booster for cooling the dual clutch during starting. This virtually doubles the amount of oil delivered on demand, without any need to increase the power consumption. Audi has designed the new seven-speed S tronic to provide both exhilarating driving and maximum economy. The new hi-tech unit operates with very high efficiency and its control system maximizes fuel economy in automatic mode. The maximum possible spread of 8.0:1 permits both a sportily short ratio for first gear and a speed-reducing high gearing for the highest gear. Light and highly efficient: the manual transmission The manual transmission that always comes with the 2.0 TDI can likewise be described as a hi-tech component. It has a light magnesium casing and belongs to Audi's new family of transmissions in which two important components have switched position – the differential is now in front of the clutch, as on the sevenspeed S tronic, in other words directly behind the engine. This arrangement moves the front axle well forward, resulting in a long wheelbase and an ideal axle load distribution. The drive from the transmission to the differential is handled by a hollow shaft angled at 7.2 degrees with beveloid gearing. The dual-mass flywheel and the hydraulically actuated single dry-plate clutch are not bolted to the crankshaft in the usual way, but supported on the transmission input shaft. Exhaustive finetuning has reduced the internal friction, thus further improving the already high level of efficiency. A special mount for the selector forks isolates the gear lever from driveline vibrations. In the driver's perception this whole technical package produces that characteristic Audi feeling of ultimate precision – the manual six-speed transmission can be shifted easily and smoothly, with short, well-defined travel. The driver information system's display incorporates a shift indicator. It shows which gear is currently in use, and if that gear has been engaged for a while, it recommends a different gear if that would be a better choice. All engines in the Audi Q5 bring their power onto the road via quattro permanent all-wheel drive. The enhanced traction, road dynamics, safety and directional stability that it delivers together make up Audi's proverbial "Vorsprung durch Technik". The performance SUV handles with unruffled stability whatever the weather, and is also an ideal towing vehicle. In classic Audi style, a self-locking center differential is at the heart of the drivetrain on the Q5, too. Operation of the self-locking worm gear is purely mechanical, meaning response is instantaneous. Its locking action is only active when the throttle is open; differences in rotational speed are tolerated when the brakes are applied and when cornering. 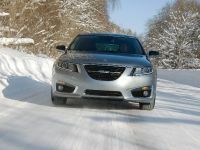 In normal driving conditions, 40 percent of engine power is directed to the front wheels and 60 percent to the rear wheels – the result is sporty handling with a rear-driven emphasis. When needed – for instance when the wheels on either axle start to spin on a slippery surface – the center differential redirects most of the torque to the axle revolving more slowly and therefore having better traction. Up to 65 percent of the power can be directed to the front wheels and up to 85 percent to the rear – this variable distribution enables the Q5 to handle a wide range of situations close to the handling limits without the ESP stabilization system needing to apply the brakes. If one wheel on an axle begins to spin, this is eliminated by the Electronic Differential Lock EDL without any brake application being needed – not that such a situation arises very often. EDL also acts as an aid when driving off. 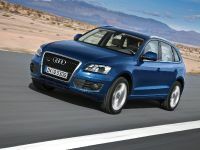 The Audi Q5 is the sports model in the SUV segment – its running gear redefines the benchmark. It combines precision and dynamism with a high level of stability and comfort. The suspension mountings, steering, wheels and brakes have been developed for top performance and the extensive use of aluminum reduces unsprung masses to a minimum. Two innovative technologies enhance the driving experience yet further – the adaptive control system Audi drive select, and Audi dynamic steering. 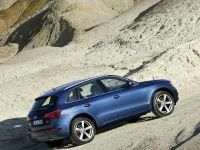 The Audi Q5 also excels on rough terrain. Its ESP and ABS use special characteristic maps for off-road driving, and there is a special function to assist the driver during steep descents. The five-link front suspension, with an ample track width of 1,617 millimeters (63.33 in), is a big factor in the dynamic character of the Audi Q5. Because the development engineers moved the differential further forward up the driveline and the clutch further back, the axle could be positioned well to the front. This configuration permits an optimal weight distribution between the front and rear axles. The battery housed in the cargo area and the rear-axle differential of the standard quattro drive underpin this equilibrium. Lightweight aluminum – a material in the use of which Audi possesses an unequalled level of experience – is used in many areas. For example the largest and most complex running gear component, the subframe for the engine and front axle, is made from aluminum. Rigidly bolted to the forward structure, it forms part of the body and its high rigidity transmits steering forces without any delay. The five-link front suspension handles longitudinal and lateral forces separately when the car is in motion. In the lateral direction the bearings are rigid, enhancing sporty precision and high cornering speeds. 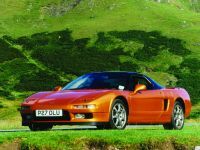 In the longitudinal direction, on the other hand, they have a supple, soft response, combining the dynamism of a sports sedan and the comfort of a full-size vehicle. 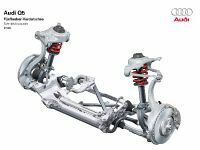 The rear axle of the Audi Q5, with its track of 1,613 millimeters (63.50 in), is inspired by the self-tracking trapezoidal-link rear suspension layout of the large A8 and A6 car lines. It combines excellent drivability and ride comfort with compact packaging. Whenever the Q5 is used for sport and leisure, it offers great advantages: the loading lip and floor are at a low height, and the floor is flat. A torsion-proof, non-flexing subframe welded together from two longitudinal and two lateral tubes of higher-strength steel form the backbone of the rear suspension. Its longitudinal tubes are manufactured by hydroforming, which involves extremely high water pressures. Four large rubber mounts connect the subframe with the body. They are particularly firm in the transverse direction for dynamic handling, but have a soft response vertically and longitudinally in the interests of comfort. The unsprung masses have again been kept to the absolute minimum at the rear axle. The two trapezoidal links are warm-hardened aluminum castings; the wheel carriers are of chill-cast aluminum. The upper control arms and the track rods are aluminum forgings. The anti-roll bar, designed as a tube like at the front axle, likewise combines low weight with high rigidity. The springs are supported directly on the wheel carriers – an arrangement that has made it possible to increase the ride comfort to luxury-car level and improve the road dynamics to the standard of a sports sedan. The separate springs and dampers also improve response; special rubber formulations in the axle mounts improve boost comfort further. The new rear suspension kinematics keep brake dive closely under control, and in this way add to the car's sporty, dynamic appeal. The standard suspension provides a generous 214 millimeters (8.43 in) of travel at the front and 230 millimeters (9.06 in) at the rear. As an option, Audi can also supply Drive Select in combination with adaptive shock absorbers, the response of which can be adjusted across a range from comfortable to dynamic. For an even more intense sporty character, there is the S line sport suspension. The damping response is a touch firmer in this instance. Whichever setup it has, the Audi Q5 is the sportiest SUV in its class. It handles with agility and playful ease, offers a spontaneous and willing steering response, and behaves almost neutrally at the handling limits. Its steering provides subtly differentiated feedback from the road, and when coming out of a bend the quattro permanent all-wheel drive provides powerful traction early on. All these strengths are typical of Audi, and in combination they create a fascinating picture of driving enjoyment, dynamic handling and comfort. 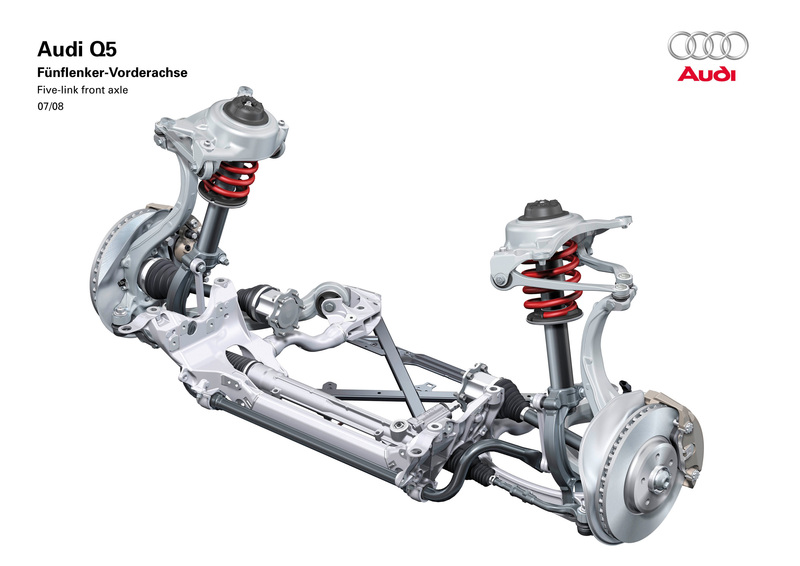 The Audi Q5's steering gear is located well forward, deep in the forward structure, just below the front axle on the subframe. This means that movement of the steering wheel is transmitted to the wheels in a very direct manner by the track rods, providing immediate steering response. The steering column is bolted onto the module cross-member in a torsion-proof arrangement; this member, which is the backbone of the cockpit, is in turn connected to the body by the bulkhead bearing mount. This strong combination further enhances the precision of the steering response. The steering gear is a rack-and-pinion design with an aluminum steering-gear casing. With a ratio of 16.1:1, the steering is as agile and direct as in a sports sedan, without coming across as twitchy. A regulated vane pump supplies the system with hydraulic energy – it only delivers as much oil as is necessary at any given operating point. 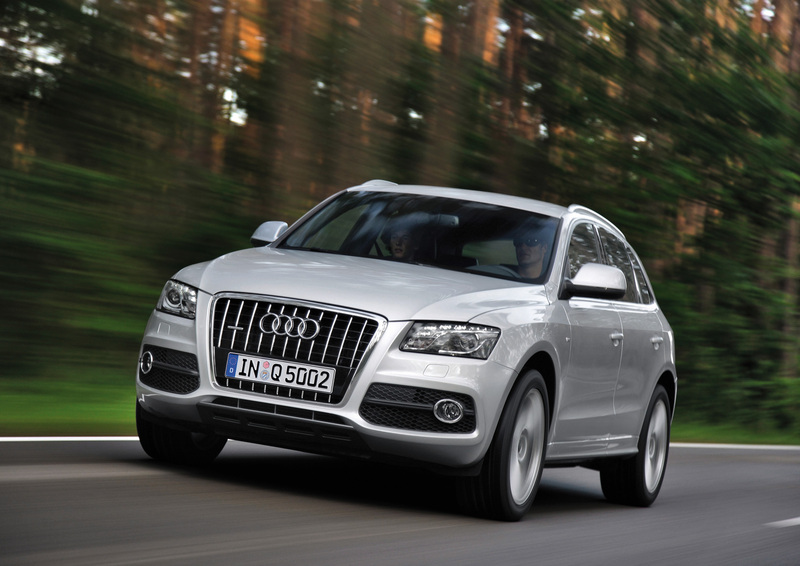 This low energy consumption improves the Audi Q5's fuel efficiency by about 0.1 liter per 100 km. The Audi Q5 comes with servotronic as standard. Configured as a speeddependent power steering system, it requires only little effort from the driver to maneuver into a parking space thanks to the high servo assistance. At higher speeds it trims back the level of servo assistance, for a superbly calm response on the freeway. 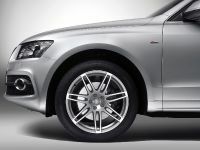 The wheels range, too, underscores the dynamic character of the Audi Q5. Audi ships its new performance SUV fitted with elegant alloy wheels in four substantial dimensions – 17, 18, 19 and 20 inches. All three engine versions come with factory-fitted size 8 J x 17 forged wheels equipped with size 235/65 tires. Alternatively Audi can supply cast wheels in the same dimension, and 7 J x 17 winter wheels. The size 8 J x 18 cast alloy wheels – standard on the 2.0 TFSI and 3.0 TDI – with 235/60 tires are available in versions with six or ten arms. There are also two versions of the optional 8 J x 19 wheels with 235/55 tires – a particular highlight being the machine-polished version painted brilliant silver. The largest wheel size available is 8.5 J x 20 and comes with 255/45 tires. The standard-fit second-generation tire pressure monitoring display is a very clever system. A software-only concept, it does not require any wheel-mounted components. By monitoring the tires' vibration it detects a rapid loss of pressure in the event of tire failure and also senses which wheel is affected. The system also notices if all four tires are slowly losing air at an equal rate – this effect, which is caused by diffusion, may amount to up to 0.1 bar per month. The tire pressure monitoring display requires no servicing or consumables such as new batteries. The large wheels of the Audi Q5 conceal brakes that are easily up to whatever braking tasks they may be confronted with. The 2.0 TFSI and 2.0 TDI with fourcylinder engines have 320 millimeter (12.60 in) diameter front disks, and 300 millimeter (11.81 in) disks at the rear. The high-performance brake pads achieve high, stable coefficients of friction and are only minimally susceptible to fading even under extreme loads. The ventilated front disks no longer have any conventional cooling ducts. Instead, the two halves of the disk are joined together by hundreds of small metal cubes that are able to dissipate a high volume of hot air very rapidly. The 3.0 TDI is fitted with composite aluminum calipers. All four disks – of diameter 345 millimeters (13.58 in) at the front and 330 millimeters (12.99 in) at the rear – are ventilated. The brake calipers have a composite design based on the floating-caliper concept. 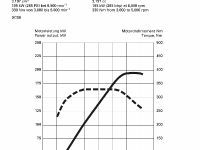 Areas calling for maximum load resistance are made from high-strength spheroidal-graphite cast iron. The aluminum piston housing dissipates the heat very effectively; despite their low weight the brake calipers exhibit extremely high rigidity. All brake disks and also the aluminum cover plates are particularly light in weight – directly benefiting the sporty handling, by reducing the unsprung masses. The design of the calipers and rims also benefits the customer in a very tangible way: the mechanic can gauge the remaining thickness of the brake pads the moment a car is brought in for servicing, without needing to remove the wheels. The ESP stabilization system, too, emphasizes the Audi Q5's sporty behavior. It operates with a new type of high-precision hydraulic valves that manage the pressure buildup with particular accuracy. It runs without any of that all-toofamiliar jolting, or obvious vibrations. The ESP can be switched to the off-road mode at the push of a button. If the driver briefly presses the button at less than 70 km/h (43.50 mph), the traction control component is shut down. This largely prevents engine-management intervention and weakens the system's brake applications. The system now permits certain sideslip angles that are nevertheless still safe – something that sporty drivers will really relish. The ESP in the new Audi Q5 includes a whole bundle of other functions. Under extreme loads, it compensates for the fading effect that is triggered off by hot brakes. In wet weather, it clears the water film off the brake disks by applying the brakes briefly at intervals to an extent that remains unnoticed by the car's occupants. And it stabilizes a trailer that is threatening to fishtail by acting on the wheels of the towing vehicle, braking them individually and out of phase with the vibrations. Roof rack identification is a novel supplementary function. 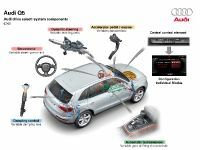 The ESP detects by means of a sensor on the rails whether the roof cross-member supplied as standard with the car is fitted and consequently whether the Audi Q5's center of gravity has moved higher. If so, it modifies its control strategy to cut in slightly sooner around the handling limits. 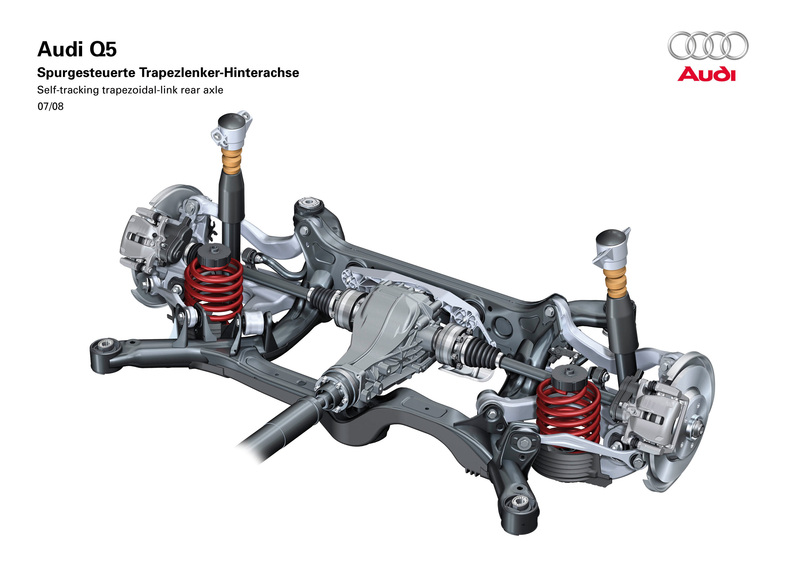 This second characteristic map has enabled Audi's suspension engineers to give the Audi Q5 a decidedly sporty characteristic for normal operation. Like the Audi A4 and A4 Avant, with which it shares a production line, the Audi Q5 can be supplied optionally with the driving dynamics system Audi drive select; this is available for all three engine versions. It takes the performance SUV into a new dimension of drivability. 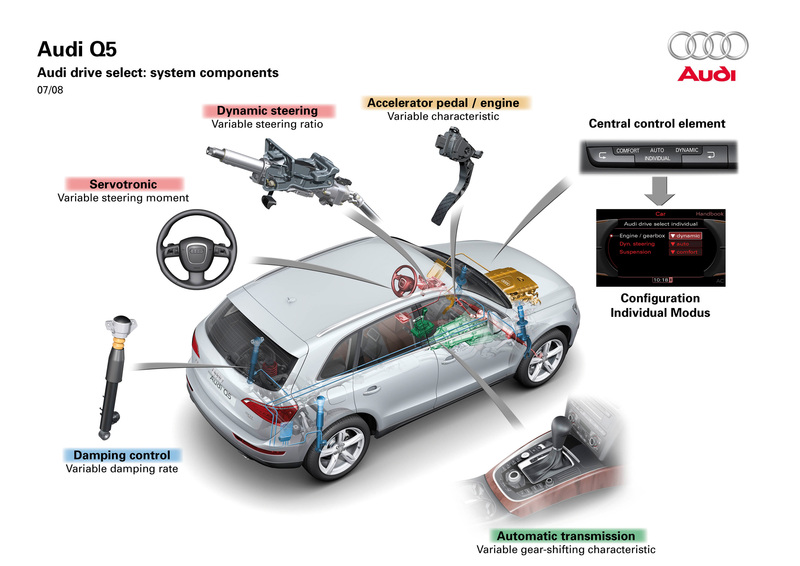 Audi drive select is designed as a modular system. In combination with dynamic steering and/or the adaptive shock absorbers, it fundamentally also accesses three other components – the engine, the seven-speed S tronic (optional for 2.0 TDI) and the servotronic steering (optional for 2.0 TDI). The engine's throttle response, the dual-clutch transmission's shift points and the servotronic's speed-dependent power assistance can all be programmed according to three characteristic maps. The driver can change between the operating modes of these technical components using two arrow keys on the center console; whichever characteristic map is active is shown lit up. The "comfort" mode is ideal for relaxed driving on long journeys and over poor road surfaces, or for urban traffic. "auto" is the most balanced setting and "dynamic" the sportily firm stage in which the running gear can demonstrate the full scope of its talents. All changeovers take place safely and smoothly and are always clearly detected by the driver, without becoming a distraction – their finesse the result of exhaustive test series. If the Audi Q5 is fitted with the MMI navigation system plus, there is a fourth characteristic map with the name "individual" available. It allows the driver to configure their own preferred parameters from two dozen options, via the MMI terminal. Although an even wider choice would be technically possible, it would result in a complexity that would be at odds with the Audi principle of intuitive operation. If different people use the Q5, their individual settings can be saved on separate keys. Two innovative technologies can be combined with drive select: Audi dynamic steering, and electronic control for the shock absorbers. Their nerve center is an ultra-responsive control unit. Its computer continuously analyzes the signals from 14 sensors, and calculates the current for the electrically governed shock absorbers at each individual wheel every millisecond. The CDC (continuous damping control) shock absorbers are hydraulic gas-filled units. An electromagnetically triggered valve regulates the flow of hydraulic fluid between the inner and outer shock-absorber tubes. Using the Audi drive select characteristic map, the control unit adapts to the driver's style and the condition of the road. If the driving style is sporty, the computer selects small flow cross-sections and therefore high damping forces, thus minimizing body movements; in urban traffic it selects large cross-sections and low forces to boost comfort. The CDC dampers are combined with sports suspension springs. Because these hi-tech dampers are able to realize lower damping forces than conventional components, they allow the car to adopt the same smooth elegance as with the standard suspension. The Audi dynamic steering in the Q5 is a technology that opens up a new chapter of automotive history. A backlash-free superposition gear in the steering column changes the ratio depending on the road speed. At the handling limits on bends, it is capable of stabilizing the performance SUV by applying minor adjustments to the steering with lightning speed. The superposition gear is integrated into the steering column and driven by an electric motor. It is also known as a harmonic drive, a principle that has already been tried and tested in aerospace technology. Its strengths are displayed in all key areas of technology. The drive operates without any backlash and is therefore extremely precise, with low friction; it can transmit very high torques and operates at a high level of efficiency. Yet it is extremely compact, light in weight and torsionally resistant to torsional stresses. The Audi dynamic steering in the Q5 can vary its ratio by almost 100 percent, depending on the car's road speed and the chosen Audi drive select mode. Transitions are continuous and imperceptible. System involvement is very direct when parking. Drivers can cover the entire steering range in just two turns of the wheel – a maneuver made nearly effortless, thanks to a high level of power assist. At moderate highway speeds, the system becomes less direct and provides less power assist. At top speeds, an indirect steering ratio and low level of power assist make it easy to keep the vehicle in its lane. The dynamic steering system cooperates closely with ESP in the vehicle dynamics and safety areas. It relieves the burden on the electronic stabilization program for the simple reason that a steering correction can be performed much faster than the time needed to build up pressure for a brake application. This rapid adjustment of the steering eliminates the need for frequent braking and generates extra smoothness and dynamism. Despite their enormous effect, drivers generally do not notice the corrections. One classic critical situation is if the vehicle's tail end skids out of control – the Audi dynamic steering in the Q5 significantly reduces the fear factor. The system can rectify a minor to moderate angle of attitude by countersteering. Only if the angle is more significant do the brakes also come into play. The new technology furthermore intervenes in the event of understeering. The steering ratio is made more indirect for a short time, so that the driver is unlikely to turn the wheel beyond the limit of good tire grip. Another type of critical situation occurs when the car is braked on surfaces where the level of grip varies. The side of the car with the better tire grip and braking force pulls the car away from the chosen line. Audi dynamic steering resolves this problem – largely on its own. Just about all the driver needs to do is turn the steering wheel in the desired direction of travel. 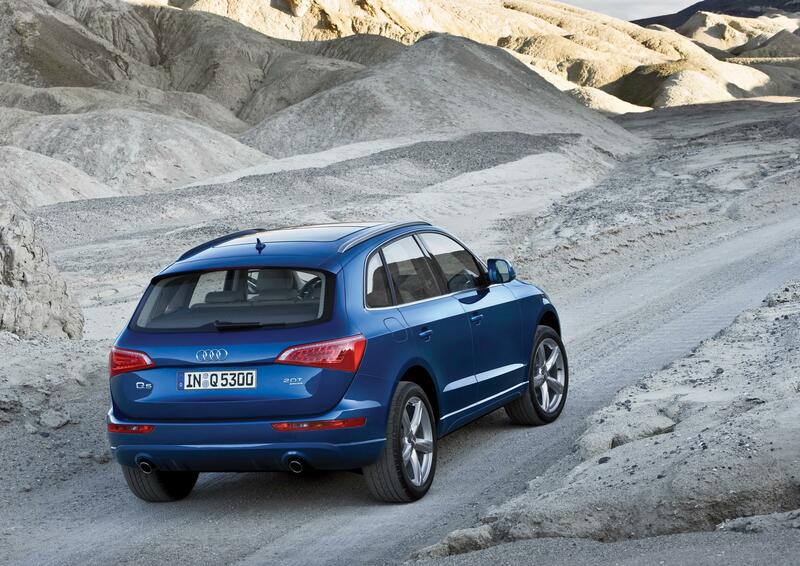 The Audi Q5 demonstrates the same poise in off-road conditions that it exhibits on roads and bends of all kinds. Here, it supplies further proof of its capabilities in the basic concept adopted for its running gear and body. Its axles allow diagonal warpage of up to 160 millimeters (6.30 in), and the climbing performance is an exceptionally high 31 degrees. Thanks to the short overhangs, the angles of approach and departure are all of 25 degrees. The ramp breakover angle – an ascent with a kink where the wheelbase and ground clearance really matter – measures 17.6 degrees, and the lateral incline 25 degrees. The ground clearance is a substantial 20 centimeters (7.87 in) and wading at a depth of up to 50 centimeters (19.69 in) is handled with ease. On the right edge of the switch strip on the center console there is a button that makes steep descents safer. At speeds within the range of 9 to 30 km/h (5.59 to 18.64 mph) hill descent assist, a special ESP function, holds the car's speed constant at the speed when the button is pressed. 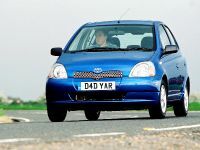 It does this initially by using the engine drag torque; if that on its own is not enough, the brakes on all four wheels are applied to precisely the degree required. 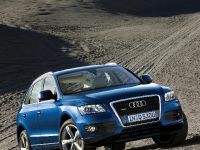 The ESP and ABS in the Audi Q5 have been extended by separate characteristic maps for off-road operation. If the driver briefly presses the "ESP-off" switch when driving off road, the system switches to a mode in which it attenuates braking and engine intervention and concentrates on maximizing traction. The ABS analyzes the surface conditions on the basis of wheel vibrations and selects the ideal control strategy for sand, gravel or scree. This usually produces a relatively harsh response that allows the tires to push along a wedge of material in front of them, thus enhancing the braking effect. Regardless of whether the versatile Audi Q5 is used for sport, leisure, family or business, it is always a perfectly relaxing and safe form of travel. Innovative assistance systems adopted directly from the luxury class make driving infinitely less stressful. These systems regulate the distance to the preceding car, help the driver change lanes and stay in lane, and assist with parking. Intelligent assistance systems are the latest trend in active safety – and the brand with the four rings is leading this development from the front. Analyses by the AARU (Audi Accident Research Unit) have shown that distractions, fatigue and poor concentration are responsible for 70 percent of all collisions. This is the starting point for Audi's assistance systems, which seek to defuse such situations by making driving safer and more relaxed. They are capable of scanning part of the area around the vehicle, then deciding and acting accordingly – in the same way as the driver does, only with much greater reliability. One of these hi-tech systems adopted from the luxury class is ACC, a radar-based adaptive cruise control system. It regulates the speed and the distance from the vehicle in front over a range of 30 to 200 km/h (18.64 to 124.27 mph) and also applies the brakes automatically within certain limits. The radar sensor, located at the front end of the Audi Q5, contains four transmitters and receivers in its housing. These send out signals with a wavelength of 76.5 Gigahertz at intervals of 100 milliseconds. The signals scan an area 180 meters (590.55 ft) long over an angle of eight degrees. The signals are fed into a computer that is integrated into the Audi Q5's data bus network and can establish contact with the control units for the engine, the S tronic and the ESP stabilization system within a matter of milliseconds. The computer constantly analyzes the differences between the successive measurements. Using the Doppler effect and the signal propagation time, it identifies how far away the vehicle in front is, and whether and how that distance is changing. By comparing the signals in the four individual antennas, it also calculates the angle of the vehicle in front in relation to the car's own direction of travel. It works out the latter from information about road boundaries such as crash barriers, and from various signals supplied by the ESP. ACC allows the driver to choose between various modes. The time interval from the vehicle in front can be adjusted over four stages and the control response in three stages ranging from comfortable to sporty. ACC speeds up the engine or applies the brakes as necessary in order to maintain the correct speed and distance, with priority given to ride comfort. Deceleration is limited to no more than 3 m/s2 at speeds above 50 km/h (31.07 mph), i.e., one-third of the maximum possible deceleration. To the driver this merely feels like moderate braking. In certain situations this automatic braking may nevertheless not be sufficient, for example if the vehicle in front brakes suddenly or the driver is unable to identify the new situation with sufficient speed. In such instances an integral subsidiary function of ACC takes over: Audi braking guard warns the driver in two stages. The first stage involves acoustic and visual signals. A gong sounds and a red signal lights up in the instrument cluster. Meanwhile the ESP ensures that the brake system is prefilled with hydraulic fluid. If the driver remains passive, the next stage is activated: the acute warning. 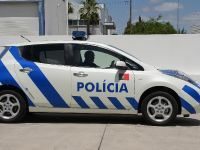 This unmistakable jolt is triggered off if the computer establishes that only an immediate response by the driver – usually meaning applying the brakes hard – will ease the situation. 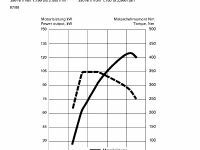 The form of the acute warning was one of the top priorities in the development of Audi braking guard. The engineers worked through various options in extensive simulations involving test candidates. The warning jolt was the clear winner; it is produced by a rapid buildup of pressure in the brake system and lasts just half a second. It slows the Audi Q5 down by no more than 5 km/h (3.11 mph) to avoid the vehicle behind causing a nose-to-tail collision. In most of the cases observed during testing, the warning jolt caused drivers who were distracted to look at the road ahead again and step on the brakes. The hydraulic brake assist system converts that pedal action into delay-free hard braking. By prompting the brake system to fill with hydraulic fluid ahead of time, ESP saves 100 to 200 milliseconds – an interval that translates into more than seven meters (22.97 ft) of stopping distance at 130 km/h (80.78 mph). Audi braking guard remains on the lookout even if the driver has deactivated ACC. The early warning, or alternatively the complete function, can however be switched off separately, in accordance with the Audi policy of leaving the driver as much control over the car as they may wish to exercise. For Audi, technology is never just an end in itself, but always at the service of the road user. The aim must always be to reduce the driver's workload, without absolving them from ultimate responsibility, and certainly without insisting on a certain course of action. Rather like ACC, Audi side assist too uses intelligent radar technology. The system warns of hazardous situations when changing lane. Two radar sensors in the rear bumper, operating at a frequency of 24 Gigahertz, scan the area next to and behind the Audi Q5, up to a distance of 50 meters (164.04 ft) from the car. A high-speed control unit analyzes the raw data. Thanks to its further improved sensors, Audi side assist is already active from a speed as low as 60 km/h (37.28 mph) – in other words, at normal speeds for urban expressways; this progress will also become available in other Audi car lines that use the system. If another vehicle is traveling at a similar speed within the critical range, or is approaching rapidly from behind, a yellow LED display comes on in the left or right exterior mirror housing. Its configuration is deliberately "subliminal", in other words it is only visible when the driver looks directly at the mirror; it is imperceptible while the driver is looking straight ahead. The LEDs brighten and begin flashing rapidly for roughly one second if, despite the warning display, the Audi Q5 driver signals a lane change. The flash is practically impossible to overlook because the human eye is extremely sensitive to changes in contrast in the peripheral field of vision. Audi analyzed the display's effect in detail in exhaustive test series involving drivers of a variety of builds and ages. The display's appearance is such that in practice it is only visible to the driver. It must not be visible to vehicles following on behind, to comply with type approval requirements, and should not be visible to the front passenger for psychological reasons. The brightness of the display adapts to the ambient light conditions and can be adjusted from the MMI operating terminal. The Audi side assist system can be deactivated at a switch located near the exterior mirror. 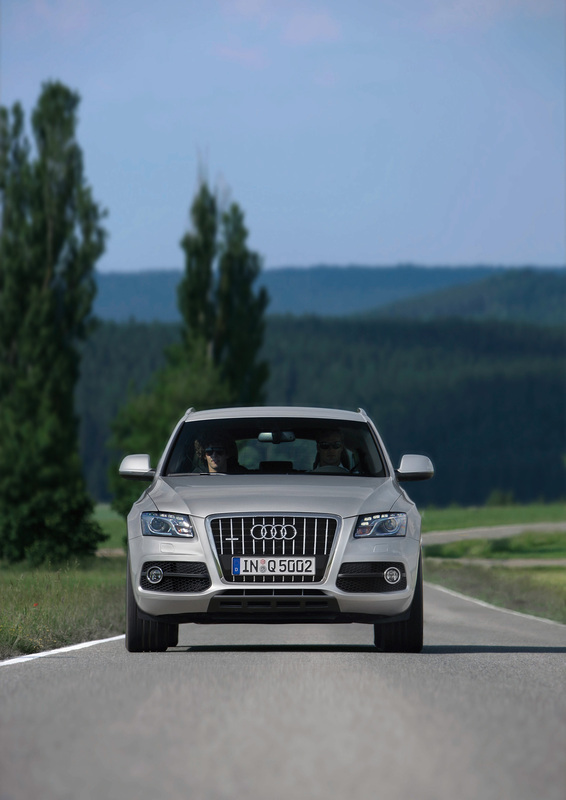 A third technology completes the portfolio of assistance systems in the Audi Q5 – Audi lane assist. From a speed of about 65 km/h (40.39 mph), it alerts the driver if they are about to drift out of lane. A small camera above the interior mirror monitors the road ahead of the car, over a field of view 60 meters (195.85 ft) long and about 40 degrees wide. A high-speed computer sharing the same housing detects the road markings. If the driver approaches one of these lines without indicating, Audi lane assist warns them by causing the steering wheel to vibrate via a motor in one of its spokes; the intensity of this vibration can be set at three different stages via the MMI. The timing of the warning can also be set at three different levels – before the wheels have even reached the lines, as soon as they cross them, or based on the system's adaptive interpretation. Audi lane assist can also be deactivated. A display indicates if it is activated but unable to provide warnings, for instance if the lines are too difficult to discern. Audi offers three parking assistance systems in the equipment range for the Audi Q5. The classic one is the Audi parking system APS, which emits acoustic signals to indicate how much space there is remaining behind the car. Audi parking system plus comes with front and rear visual displays, as well as a total of eight ultrasonic sensors in the bumpers. The Audi parking system advanced, which has an integral rearview camera, is the choice for maximum convenience and safety. Incorporated into the tailgate, this extremely light-sensitive camera contains a fish-eye lens providing a generous 130-degree view of the area behind the car. Its rectified images are displayed on the large on-board monitor. The display includes various guide lines and zones to help the driver position the car correctly when reversing. When reversing into a parking bay at a right angle to the direction of travel – the standard mode – there are orange lines to indicate the path that the car should follow. For parallel parking, areas shaded blue indicate the space needed for the Q5. They show whether the gap is large enough; red and blue lines assist with the steering and countersteering process. The camera image also shows the optional trailer tow hitch, so that the Audi Q5 can be reversed up with the hitch exactly beneath the trailer drawbar. Thanks to its ultrasound sensors, the Audi parking system advanced also offers the traditional functions of visual and acoustic parking assistance. The driver can use the MMI controls to switch between the video-camera image, a graphic display and automatic changeover between the two. The area of multimedia, in which information, entertainment, navigation and phone all come together, is one of the most attractive fields of contemporary and future technology. Here too, the Audi Q5 sets new standards within its segment – it makes its debut with an extremely wide range of technologies. Audi equips the Q5 with a high-performance audio system as standard. The chorus radio includes a tuner module with 30 station memory locations and a CD player. GALA speed-dependent volume control is also standard. The 80W output is transmitted along four channels to eight speakers. As with all audio systems in the Audi Q5, the screen and user interface are located in different fields on the chorus radio. The monitor is the standard monochrome 6.5-inch display. The structure of the control panel, located lower down in the center console, echoes the logic of the brand's compelling MMI principle; it has one central rotary control/pushbutton and large function keys. The concert and symphony radio systems represent the next level in the product range. Both of them operate in conjunction with a 6.5-inch color monitor. Their control panel is again in the center console; their output of 4 x 20W is distributed to eight speakers along four channels. The concert radio has a single CD drive, and the symphony model incorporates a CD changer. Both sets can also play music files of MP3 and WMA formats. They also include SD card readers for audio files and AUX-in connections for MP3 players. The two audio systems become even more versatile when combined with the optional lifestyle feature AMI, the Audi Music Interface. This interface is the ideal way to integrate an iPod, the most attractive music storage medium currently on the market. 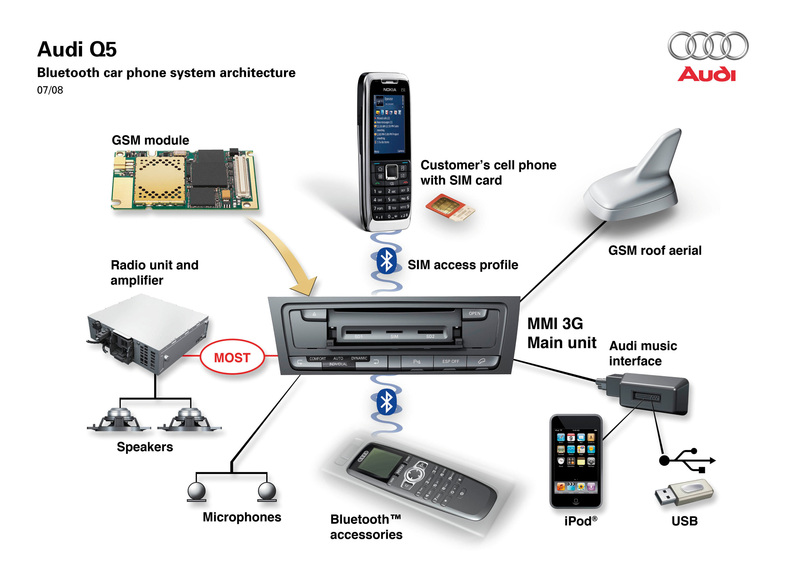 The iPod and its entire range of control functions are fully integrated into the Q5's electronics architecture via the AMI connection. An iPhone can also be connected up. The on-board display shows its menu structures complete with all lists and information, and it is operated via the radio or the optional multifunction steering wheel. The interface links with a fourth-generation iPod and upwards. A separate adapter cable can in addition be used to connect up any other audio player with a USB 2.0 interface. The AMI software is modular in design; individually stored protocols handle communication with the players. New driver updates can be installed quickly and easily any time a new device comes onto the market. Another highlight available for the concert and symphony radios and the MMI navigation plus is DAB (Digital Audio Broadcasting). In terms of dynamics, clarity and spatial impression, the digital signals that are broadcast virtually areawide in Germany, the UK and many other countries are easily superior to the analog standard. DAB tuners use a computer to process the signal, while also processing additional information for radio text. The audio system is integrated in the navigation system. Its controls are accommodated in the MMI operating terminal on the center tunnel. A fast fiber optic cable links the components behind the user interface, while a special gateway acts as an interface with the remaining vehicle control units. 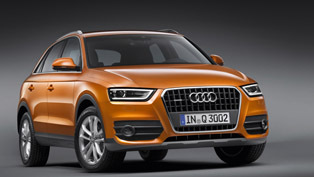 Buyers of the Audi Q5 can choose between two versions. MMI Basic plus operates with a 6.5-inch screen. A high-speed DVD drive supplies the map data for navigation, and the CD drive also plays MP3 and WMA formats. Voice control is present as standard; as well as processing individually spoken letters, it can understand entire terms. Audi offers two further exceptional options in the shape of the Audi Music Interface and DAB reception. One of the two tuners receives the chosen station, while the other searches for all other receivable stations in the background. Even relatively weak signals are noise-free because the double tuner can combine the Q5's two antennas to form a single directional antenna. The top version is MMI Navigation plus. It pioneers an entirely new generation of systems and offers a hi-tech portfolio that breaks new ground. Its special features are an audio and video DVD drive, and a 40 GB hard drive for the navigation system. It doubles up as memory space for MP3 files, and can also hold 2,000 addresses. A pioneering computer unit is able to handle simultaneous processing of the myriad infotainment functions, all of which require considerable computing power. It combines an 800 MHz processor with a 500 MHz digital signal processor, which for instance enables DVDs to be played in 5.1 Dolby Digital quality. The graphics processor that generates the 3D navigation images also redefines the benchmark with its extremely high detail quality and its fluid dissolve effects. The top navigation system's monitor is another innovation. It measures seven inches diagonally and has an extremely high-resolution display of 800 x 480 pixels – its picture is rich in contrast and incredibly sharp even in difficult light conditions. To match, there is the optional TV tuner, which can also receive topquality digital programs (DVB-T). The new navigation system incorporates another exclusive highlight. The picture mode of bird's eye view can now be chosen; it shows the landscape in topographical relief, in all its detail, complete with three-dimensional images of landmark buildings. Another new concept has been introduced for the monitor: whenever detail functions of the air conditioning are changed, such as the heated seats, they now no longer fill the entire screen; instead, they simply appear in a pop-up window on the right. Audi offers a choice of two other sound systems for its concert and symphony radio systems. 180W of system power and 10 speakers give the Audi sound system well-balanced surround sound. In addition to eight conventional speakers, it incorporates a center speaker in the dashboard and a 260 millimeter (10.24 in) subwoofer at the rear. But the icing on the cake is the sound system from Bang & Olufsen – the epitome of sheer audio pleasure. A wide, subtly differentiated frequency range, sparkling brilliance, highly detailed resolution and precise spatial impression – this system by the Danish sound wizards, adopted from the A8 luxury sedan, is of the very highest caliber. 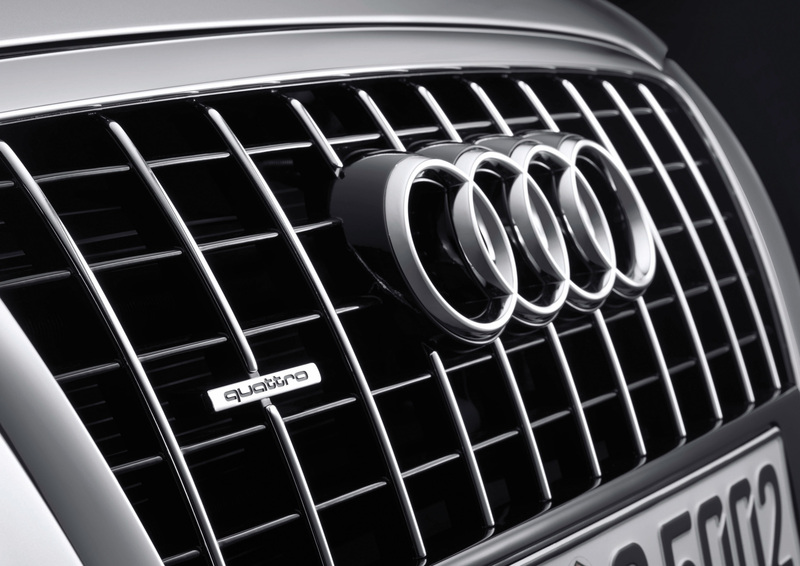 The two brands Audi and Bang & Olufsen have joined forces in pursuit of the same objectives. Ultramodern technologies, clear operation, sophisticated technoid design and uncompromising quality are a question of honor for both partners. Like Audi, Bang & Olufsen possesses a wealth of expertise in the use of aluminum – the Danish company uses this material for the speaker covers. The key element of the Bang & Olufsen sound system is an amplifier with an output rating of 505W. It processes signals according to a specific surround algorithm, which enables the occupant of every seat to enjoy the system's exquisite audio quality. The system analyzes the noise level inside the Audi Q5 by means of a microphone and makes selective adjustments to its output signals in specific frequency ranges. The amplifier controls ten active channels with 14 speakers. There are two three-way systems at the front, and two speakers in each rear door. The choreography is rounded off by a center speaker in the instrument panel, a subwoofer in the spare wheel well and two surround-sound speakers. Another option in the Audi Q5 that particularly the kids will love is Rear Seat Entertainment. This comprises a monitor with integral DVD drive, and is inserted in special mountings on the back of the front seat. The unit has an integrated power supply. From the concert/symphony radio systems upward, Audi provides the option of a Bluetooth cell phone preparation that integrates the phone into the radio operating system with the option of voice control. The phone can optionally be stored in a steplessly folding-up bracket in the center armrest. The Apple iPhone can also be integrated. But the most elegant way to integrate a phone is with the Audi Bluetooth car phone, which is available for the MMI navigation plus. The driver's cell phone must support the corresponding profile in order to phone using Bluetooth in the ultra-convenient SIM Access mode – many of the latest-generation models do this. The system in the Audi Q5 automatically handles all functions as soon as the ignition key is in place. The cell phone never has to leave the driver's pocket, and Bluetooth uploads data from the SIM card and memory to the car's phone. The cell phone then switches itself off, avoiding GSM radiation and saving battery charge. The Audi Bluetooth car phone uses the vehicle antenna for transmitting external signals, for optimum signal quality. The phone can be operated via voice control, the MMI terminal or the multifunction steering wheel. A digital speech processor suppresses interference, for excellent hands-free quality. Speech output is via the sound system, using the MMI's volume control. The system can also be supplied with the option of a cordless handset. 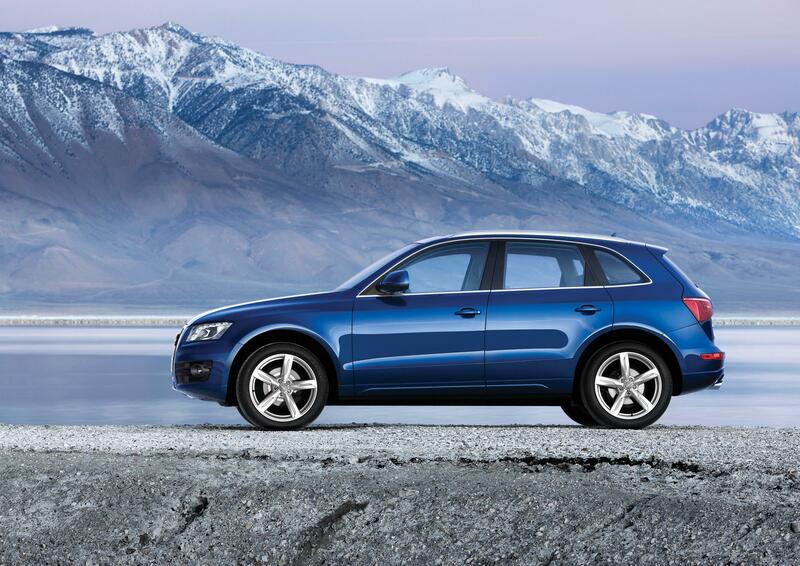 The Audi Q5 is a versatile, lavish SUV in terms of its equipment and trim, too. All versions are factory-fitted with luxury features such as automatic air conditioning, an audio system and daytime running lights. 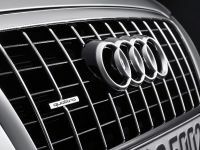 Audi in addition offers a broad range of equipment options, some of them adopted directly from the luxury category. For individualists, there is a wide range of design packages to choose from. 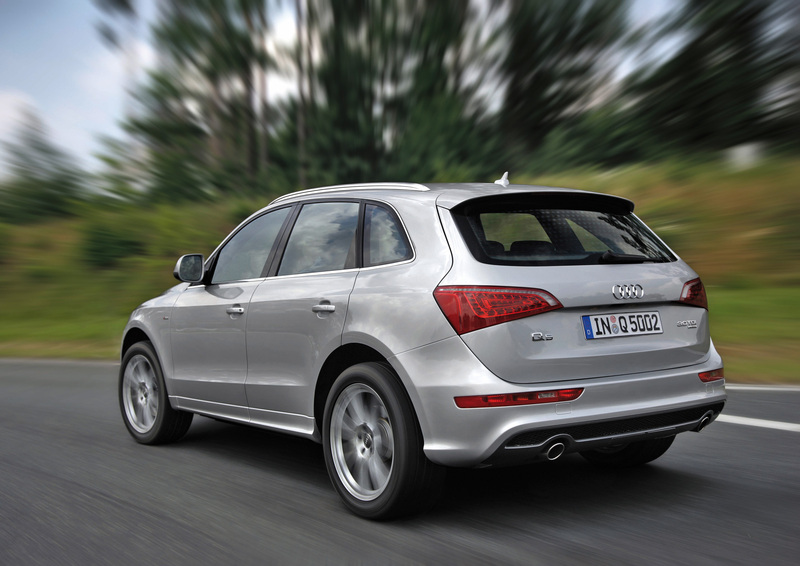 The Audi Q5 has a comprehensive range of technical safety systems. 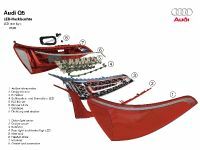 These include two front airbags on either side with an adaptive operating principle that offers a particularly high level of protective potential, two side airbags at the front and two head airbags that unfurl along the entire length of the windows. All seats have three-point belts, with tensioners and belt force limiters at the front, and can be adjusted in height. In a rear-end collision, the integral head restraint system averts the danger of whiplash injuries. Daytime running lights are another standard-fit safety feature that ensure that the premium SUV is easy to spot. 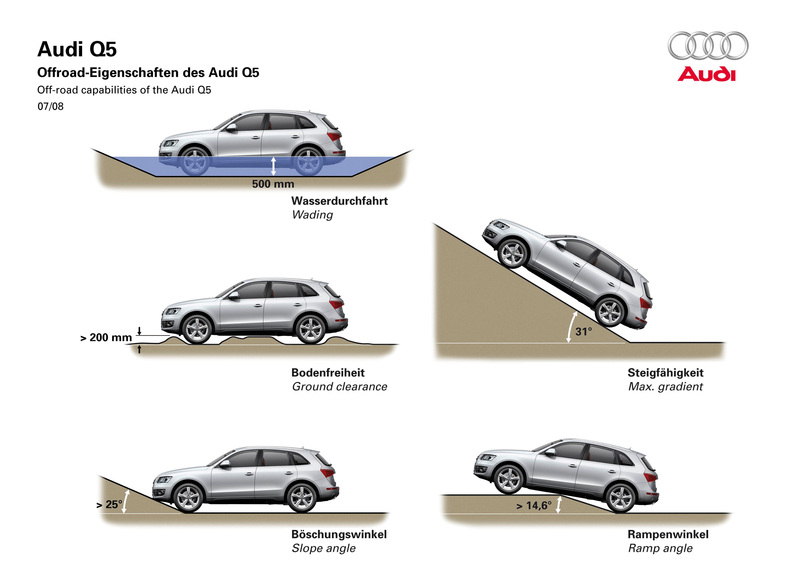 Audi hill hold assist boosts safety when negotiating steep descents off-road. Furthermore, a tire pressure monitoring display is fitted as standard in the Audi Q5 3.0 TDI. 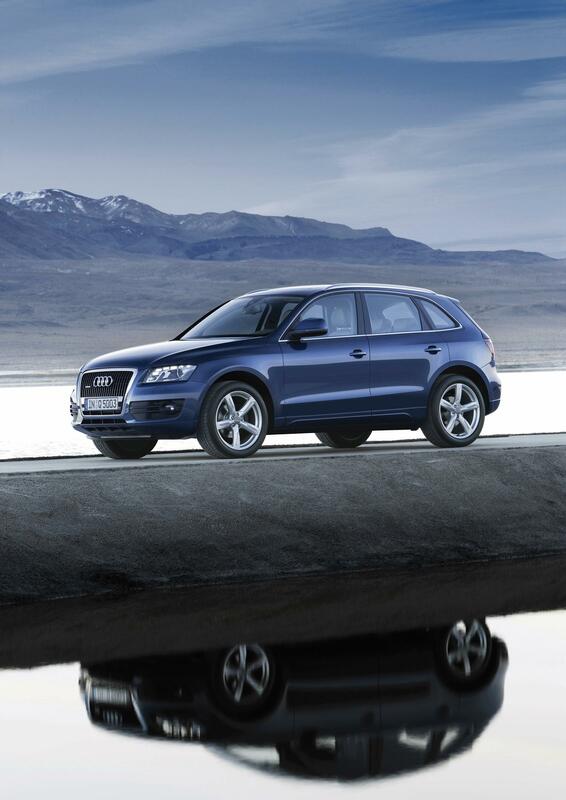 When it comes to comfort, the Audi Q5 is equipped with a whole raft of agreeable features. These include electrically adjustable, heated exterior mirrors as standard, four power windows, central locking with radio remote control and heightadjustable front seats. The electromechanical parking brake makes stopping and starting a very convenient affair, and automatic air conditioning keeps the interior climate agreeable at all times. The chorus radio with a CD player, eight speakers and a 6.5-inch monitor hits just the right note, and the intelligent key serves as a memory chip for personal settings and vehicle data. 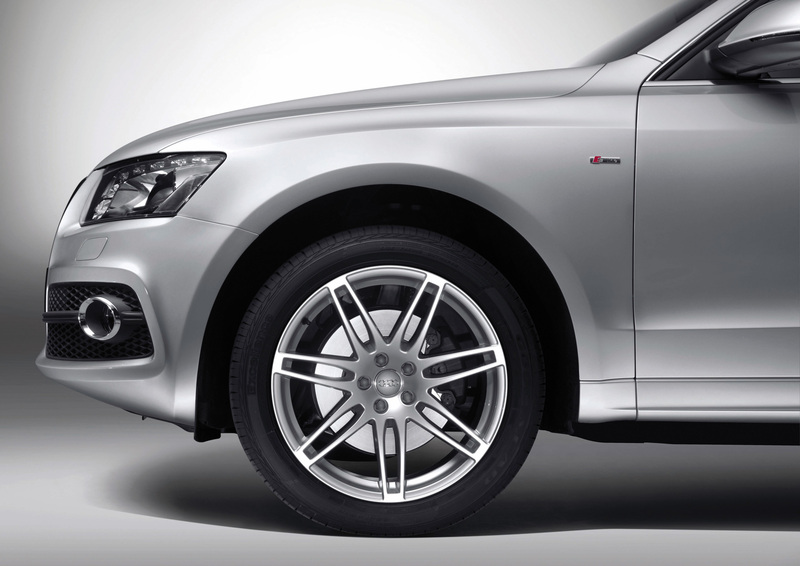 17-inch alloy wheels accentuate the Q5's sporty appeal. The roof rails and inclinable seat backs provide extra variability for carrying sports equipment and luggage. Yet more highlights can be added optionally to the Audi Q5's exterior. 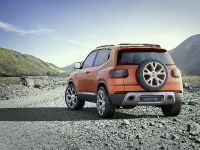 With its striking add-on parts and bumpers including a stainless steel underbody guard and 19-inch or 20-inch wheels, the Offroad styling package gives the premium SUV a potent, typical off-road look. The S line exterior package, on the other hand, adopts an ultra-sporty flavor for the bumpers and door trim strips, which are painted in the body color. The S line sport package immerses the interior in cool black, with the inlays in matt aluminum or black piano finish providing subtle contrasts. The sport seats are upholstered in cloth/leather or a combination of perforated Alcantara and leather. The steering wheel, gear lever gaiter and floor mats have a special design. Cast alloy wheels measuring 19 or 20 inches in dimension and sport suspension from quattro GmbH enhance the dynamic performance of the Q5. In addition, by way of introduction to its custom equipment range quattro GmbH can supply the Audi exclusive line as familiar from other Audi models, with color-contrasting interiors. 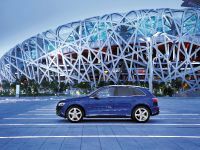 Audi also offers an extensive range of individual options for sport enthusiasts. 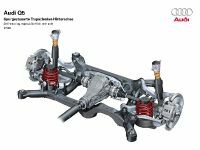 As well as mechanical sport suspension, there are components for the hi-tech driving dynamics system Audi drive select, including dynamic steering and adaptive control for the shock absorbers. 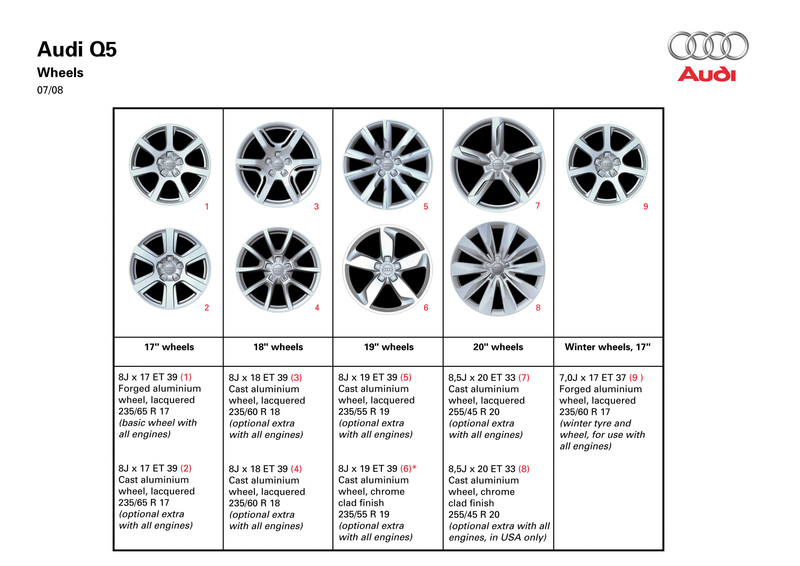 The selection of alloy wheels covers diameters from 17 to 20 inches. The exclusive interior ambience is one of the Q5's major strengths. Audi offers seven design packages, which introduce even more finesse into the interior. They combine various upholstery fabrics – Havanna cloth, Micron cloth, a leather/Alcantara mix, Milano leather and Fine Nappa leather – with the standard and sport seats as well as various inlays. Aluminum elements, a leather package and an interior lighting package complete the range of options. Audi has developed a wide range of intelligent solutions for customers who are actively sporty in their leisure time. A rail system subdivides the cargo area variably, and small items can be stowed away quickly with the storage package. The sliding rear seat bench plus, complete with large load-through hatch, increases the size of the cargo area. The equipment options list also includes an electric trunk lid, a dirt-resistant tray, a ski bag, a reversible mat, a pivoting trailer tow hitch and a front passenger seat with folding seat back. 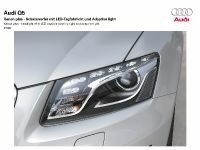 Where lighting is concerned, Audi offers xenon plus headlamps, the adaptive light cornering light system, a light and rain sensor and a new high-beam assistant. There is also an extensive range of equipment for passive safety including side airbags for the outer rear seats, an anti-theft alarm and Isofix child seat mountings for the front passenger's seat, coupled with airbag deactivation. Seating comfort can be even further enhanced by various luxury technologies. For additional journey pleasure, front seat heating and electric position adjustment – with a memory function if desired – are available, as well as sport seats and climate-controlled comfort seats with ventilation and automatic heating. Audi can also supply an electric lumbar support, a front center armrest and heating for the outer rear seats. The optional three-zone automatic air conditioning, auxiliary heating system and sunroof are the key to the perfect feel-good climate on board the new Audi Q5. Alternatively there is the panoramic sunroof – it comprises two large glass halves, the front one of which can be slid back over the rear one at the push of a button. A wind deflector keeps the level of wind noise down to a minimum and the roller sunblind is also power-adjusted. The comfort attributes for the Audi Q5 include the extended parking brake function Audi hold assist, the driver information system, cruise control, advanced key vehicle access, the garage door opener, the automatic anti-glare interior mirror, the climate-controlled cup holder, two different multifunction steering wheels – optionally with shift paddles for S tronic – and two parking aids with acoustic and optical functions. The assistance systems have a sheer hi-tech character. These are the Audi parking system advanced with rearview camera, the lane departure warning system Audi lane assist, and Audi side assist, which provides a warning if it is dangerous to change lanes. The adaptive cruise control system maintains a constant speed and distance from the vehicle in front, and in emergencies braking guard instructs the driver to brake. In the domain of communication and infotainment, the Audi Q5 offers a remarkably high-powered range of components. It begins at audio level with the chorus, concert and symphony radios, and extends through the Audi sound system right up to the high-end sound system from Bang & Olufsen. Features such as digital radio (DAB) reception and the Audi Music Interface for full integration of an iPod complete the program. The Audi Q5 also breaks new ground for multimedia performance. MMI navigation plus operates with a large hard drive and two high-speed memory chips, and its large, high-resolution display can show the landscape in the form of a topographical.